earned his third Paul Harris Pin. 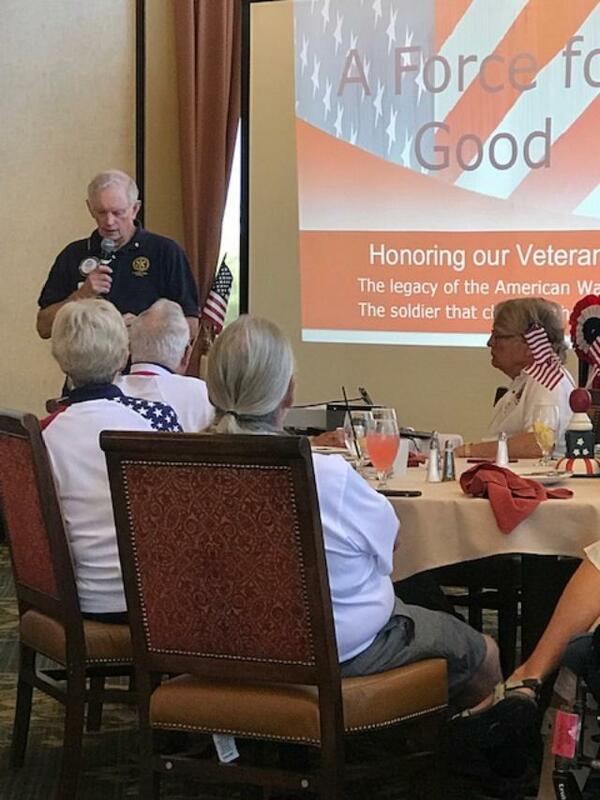 Public Relations Director) spoke on the incredible work this Charity does in Tucson. year 37,000 people were helped with donations of over $1,000.000. Four Way Speech Contest this week! Enjoy Ed Treick and wife Barbara at their wild Mardi Gras party on March 1st. Come and enjoy the fun with your fellow Rotarians and spouses. is our next Christmas Party! because they had already left for the holidays, so we moved the date up. PLEASE give this date to the person who is your family "Social Chairperson"
so you can plan your holiday travels around our party date. 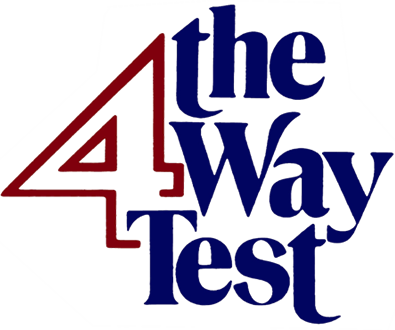 *NOTE: The Pledge and 4-Way Test speakers will be randomly selected by the President from the podium.... Stay Alert!! Please forward and share this bulletin with your friends and family, and go to our Facebook page and promote YOUR club. 'Like' our page, like a post, make a comment or two and most importantly share your favorite story on your 'Timeline'. Chris Millar, Chair of the Community Service Committee, and Joe Guyton are setting up a work day to help with outdoor work at the home of a Catalina hospice patient. We'll be meeting by the side of the Valero Gas Station by Basha's at 9:00 am on Tuesday, February 26th and traveling to the home together. The original date was frozen out. 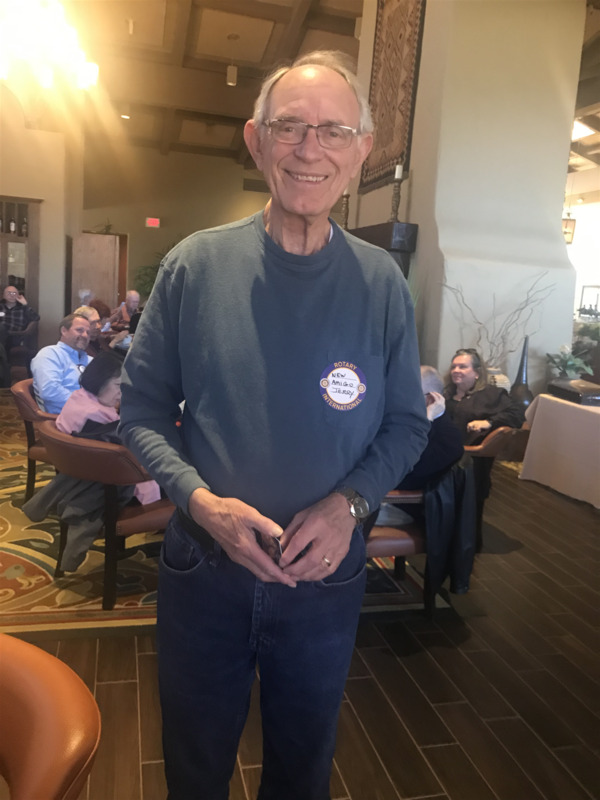 Neil Deppe, Chair of the Fundraising Committee, has the Jim Click Raffle Tickets and is beginning to pass them out to people. Be sure to get your tickets from Neil! Elaine Terry's son Brandon was originally scheduled to have heart surgery this Monday, February 25 at Arrowhead Hospital in Glendale. Pre-op tests indicated further investigation was needed before open heart surgery. Hopefully Brandon will be able to have his heart surgery on Tuesday, February 26th. 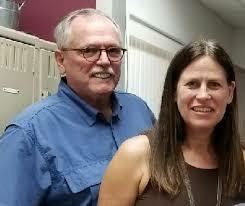 Elaine and Don have found a place for them all to stay in the Phoenix area while Brandon recovers. Several members stayed after the last meeting to clean out our storage area at the SaddleBrooke Clubhouse. We found all kinds of goodies. Many thanks to those who stayed an helped: Wendy Guyton, Phil Barney, Barbara Barr, Paul Herr, Joe Guyton, and Chris Millar. I hope I didn't miss anyone! Cammy Moore is at Brookdale Oro Valley and would enjoy company and calls. She is currently living at the Brookdale which is right across the street from the Fairfield Inn and the Mexican Restaurant called El Molinito. Many thanks to Ed Treick and his wife Barbara, who are preparing an incredible Mardi Gras Party for us on Friday, March 1st. 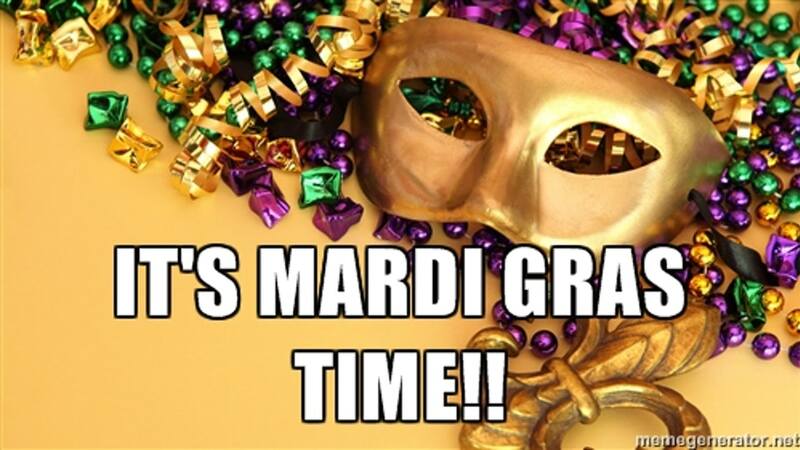 Hope everyone is getting their masks and beads! While costumes are optional, I hear there is a prize for the best costume! They could still use additional help, contact Ed at etreick@wi.rr.com. 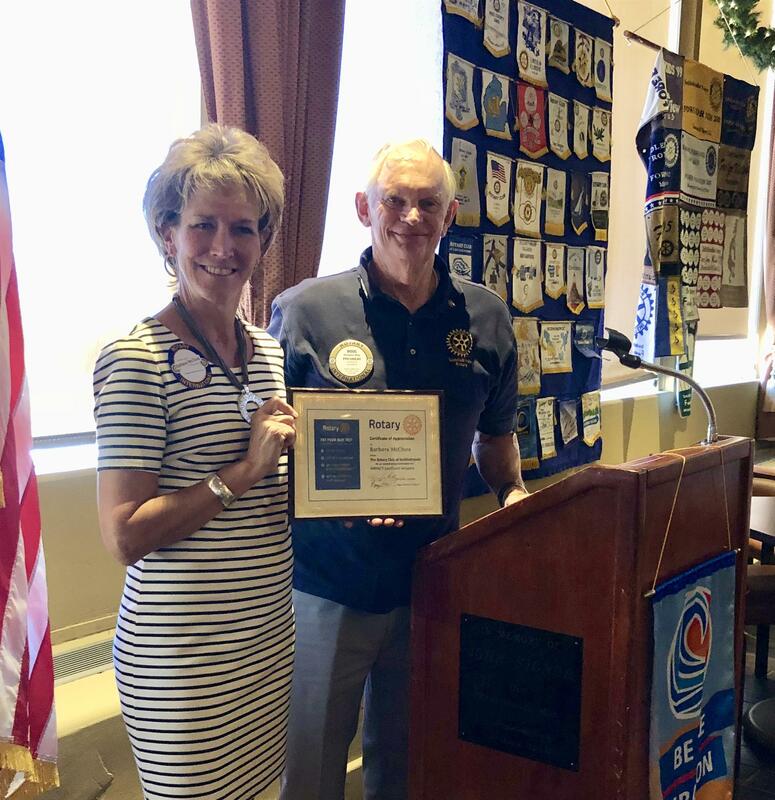 Many thanks to Wendy Guyton, who has really knocked herself out to find Rotary training for Rotary's Child Protection Policies. Also a big thank you to Paul Herr for lending his legal expertise to the project! 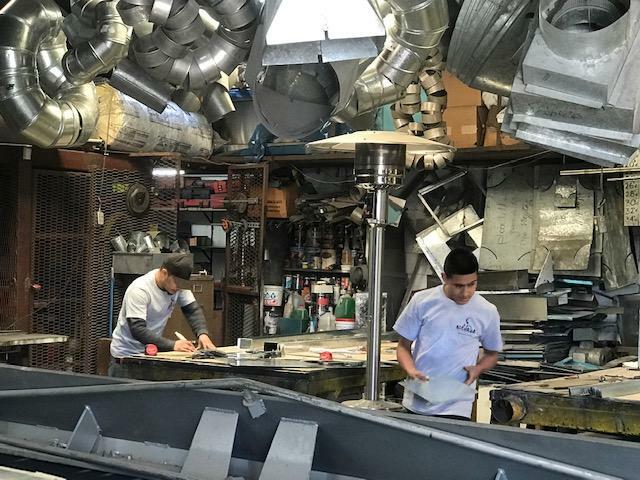 Stay tuned as some exciting things are in the works! Remember that we will be meeting off site at the SaddleBrooke Ranch on Thursday, March 14th. Many thanks to Doug May and Gary Terrell for making the arrangements. Stephen Argentati made some great posters about the event. 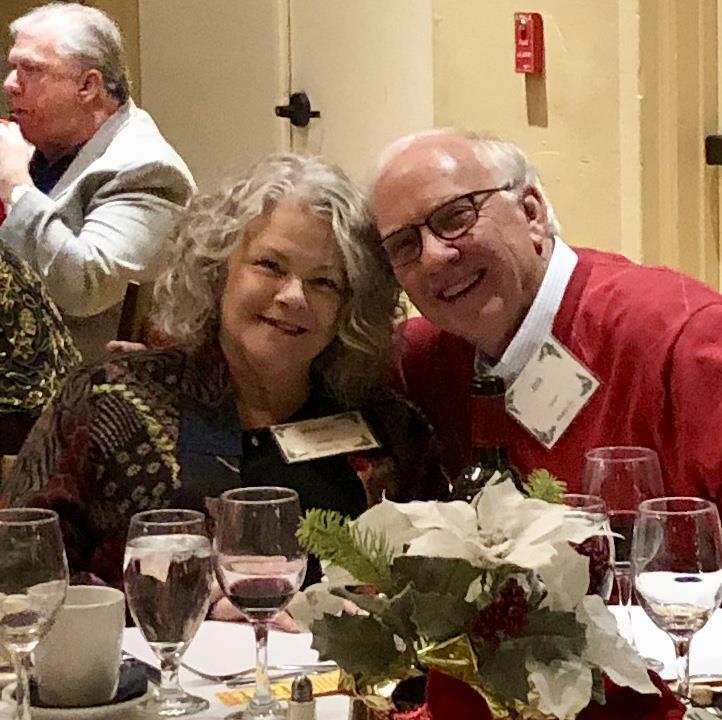 Stephen and Sheila Tuhy have written articles about the luncheon for the SaddleBrooke Ranch Round Up and SaddleBag Notes. SAVE THE DATE! THURSDAY, DECEMBER 5TH will be our next Christmas Party. Last year a number of people missed the party because they had already left the area for the Christmas holidays. So we moved the party up one week earlier in hopes that EVERYONE can attend. 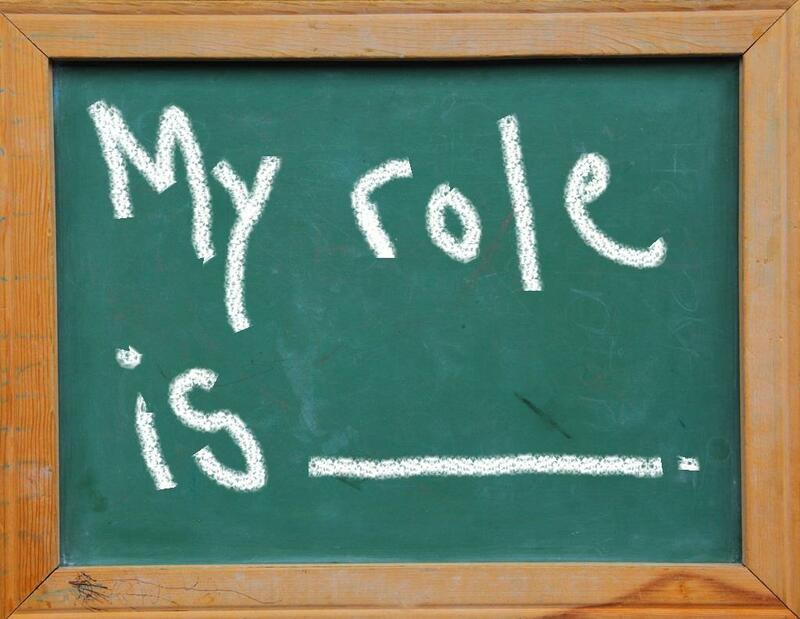 Most families have one person who is kind of the "Social Chairperson" for the family. PLEASE pass this date along to your family "Social Chairperson" so you can make your travel plans around it! 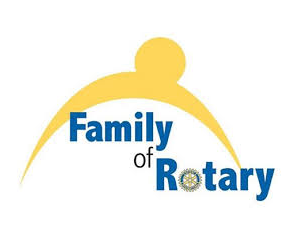 Join members of the Rotary Club of SaddleBrooke on Tuesday, February 26th as we do a Community Service Project for a Catalina Hospice Patient. We'll be cleaning up her yard. As parking is limited, we will meet to the side the Valero Station by Basha's to car pool to the home. Many thanks to Joe and Wendy Guyton for finding this need and taking it to the Chairman of Community Service, Chris Millar. This is the "rain date" , errrr "arctic blast date" for the event which was originally scheduled last week! Butterfly Magic is a must see at Tucson Botanical Gardens! 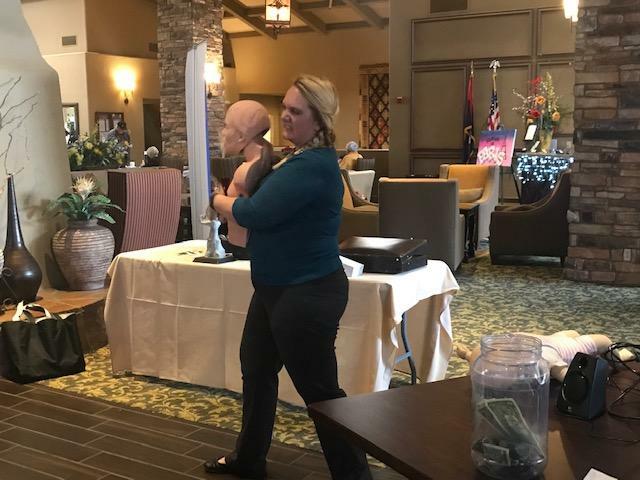 demonstrates the Heimlich Maneuver on a dummy. 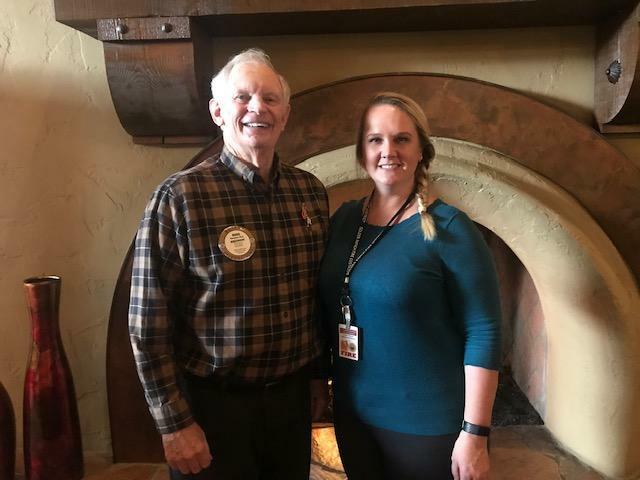 Amber Prince (Registered Nurse with the Golder Ranch Fire Department) spoke to our Rotary Club on Valentine's Day about CPR Protocols. saving lives, go to http://grfdaz.gov/ or call 520-825-5920. 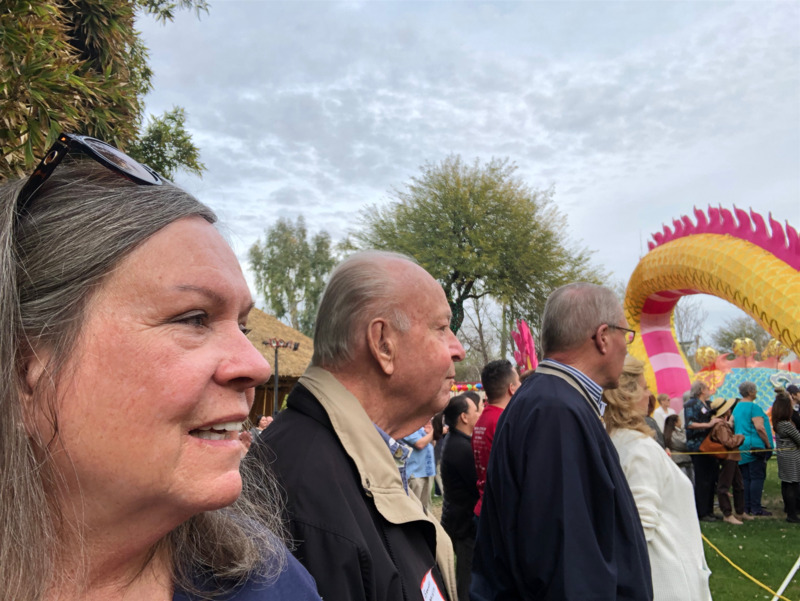 Fundraising Chair, Neil Deppe, invited President Elect Barbara Barr and President Nominee George Corrigan to join him at the Jim Click Kick Off. 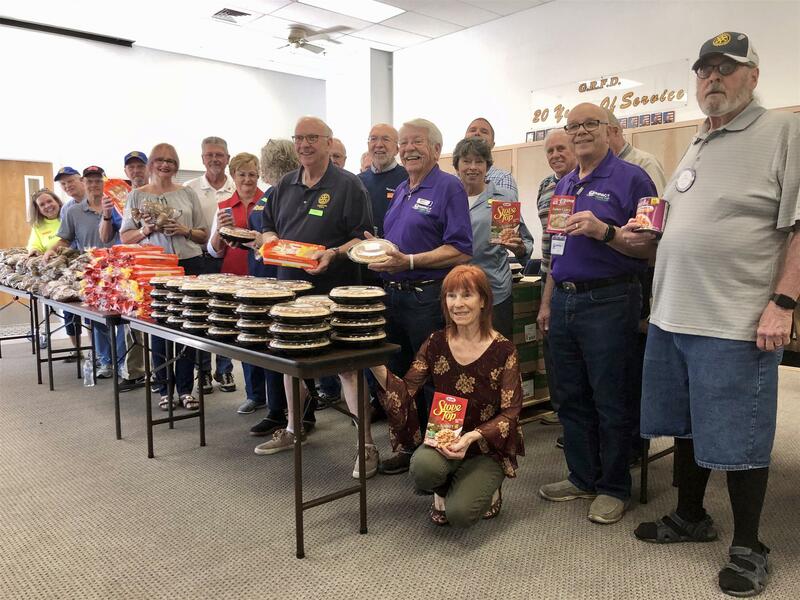 Clubs across Tucson raise funds through this program. 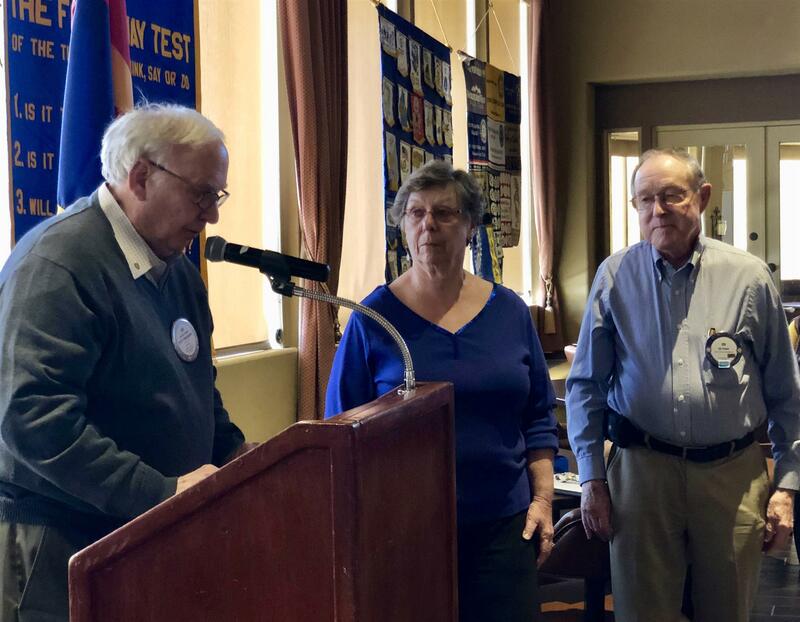 Pictured left to right: Barbara Barr, George Corrigan, and Neil Deppe. "I's a good problem to have!" we all agreed! 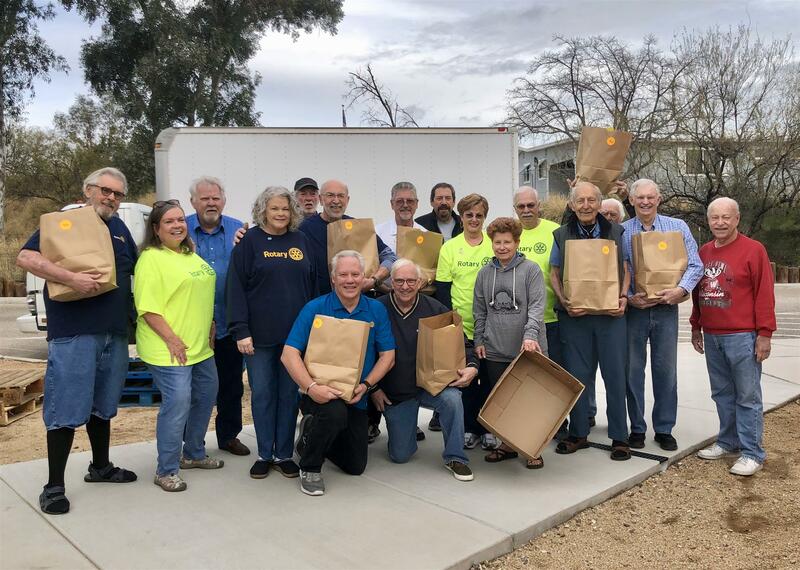 We had so many Rotarians show up on a beautiful Saturday morning to help bag food for the Food Bank, that we actually had to work in shifts to give everyone turns. There's nothing like a little Saturday morning fun with friends while we strive to make the world a better place! We even discussed bi-laws and the website while we were at it. Many thanks to Joe Dylewski, our Board Member at Large, for organizing this service event. We always have fun making a difference in our community and our world! Ed Treick just gave an amazing gift to his wife, Barbara. 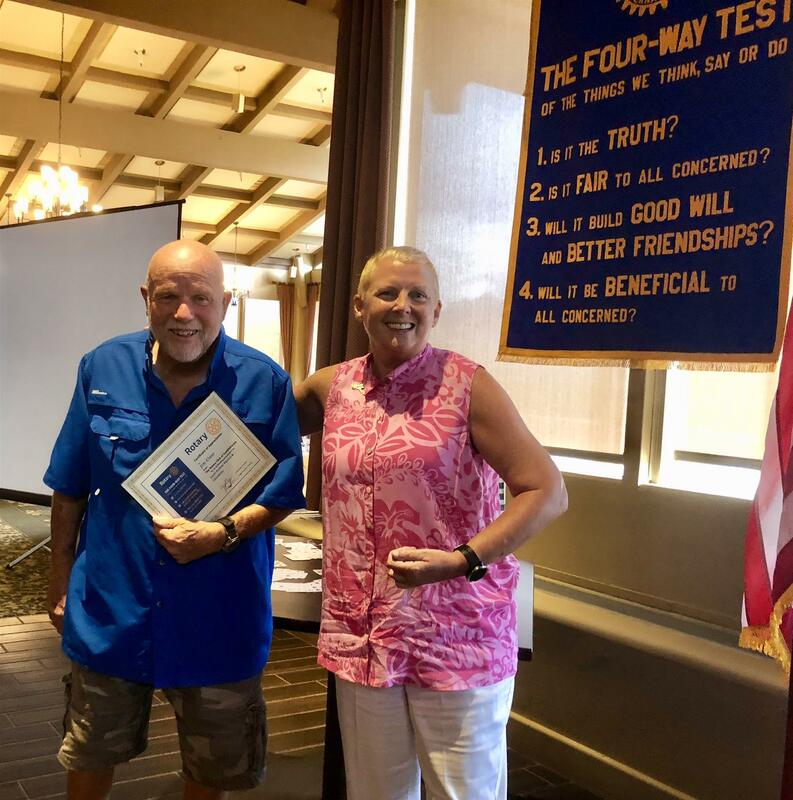 He used his Paul Harris points to award his wife with her 4th Paul Harris Award. 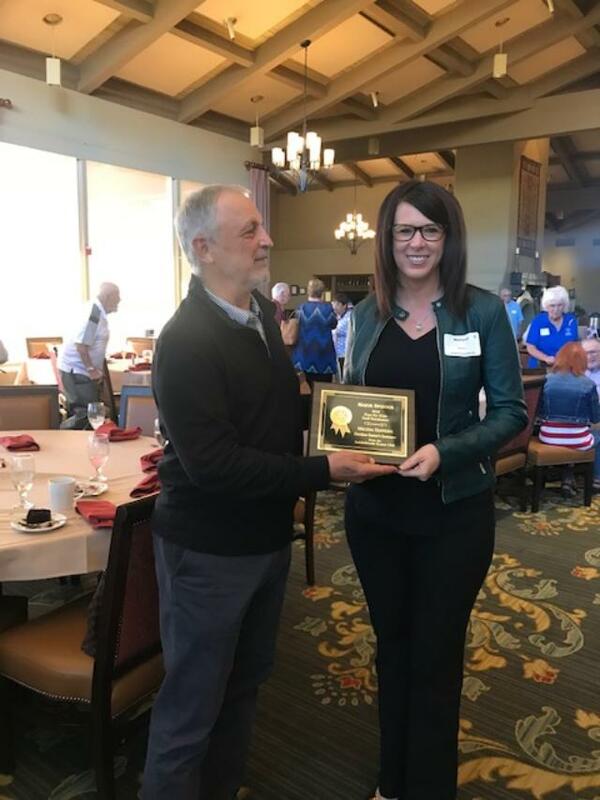 Barbara Treick was honored in a special ceremony by Joe Guyton. It seems like she appreciated her gift as she thanked Ed with a kiss! Membership Chair, Wendy Guyton, warmly welcomed our newest Rotarian, Nancy Heck, with an inspiring initiation. 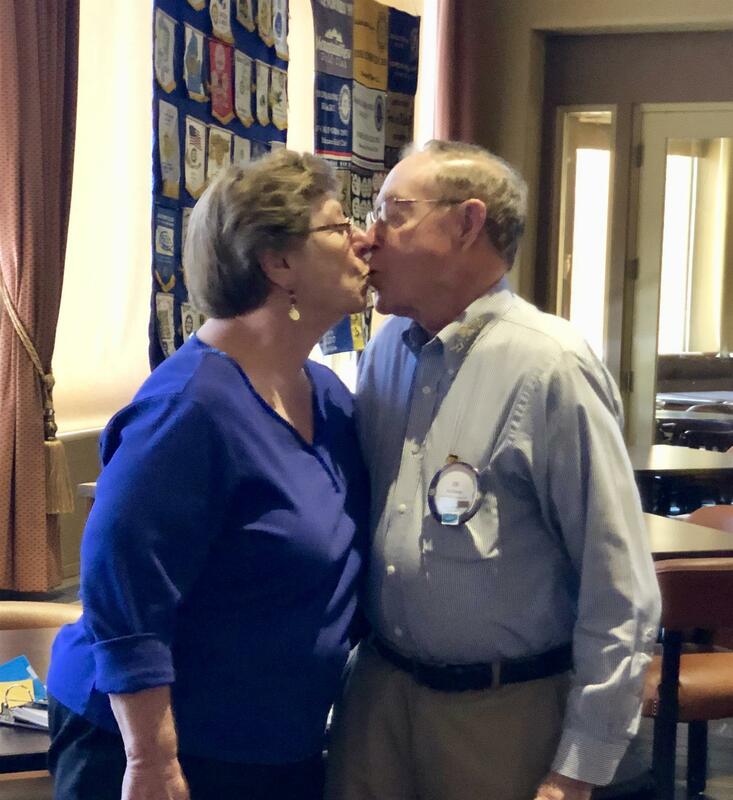 We are so happy to welcome Nancy to our Rotary Family. 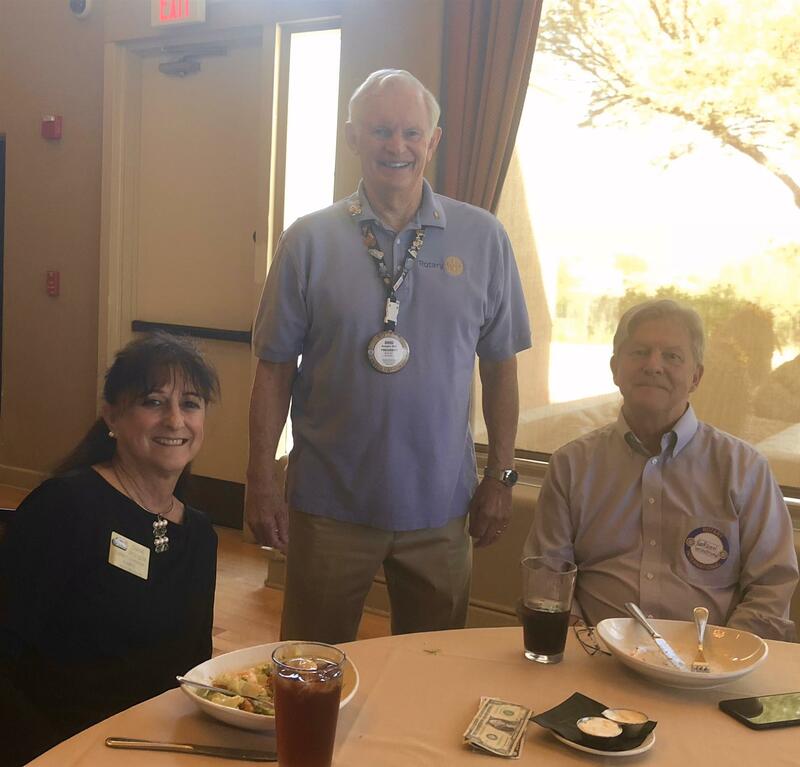 Left to Right: Wendy Guyton - Membership Chair, Nancy Heck - our newest Rotarian, Ron Heck - our valued club member, and Doug May - President. 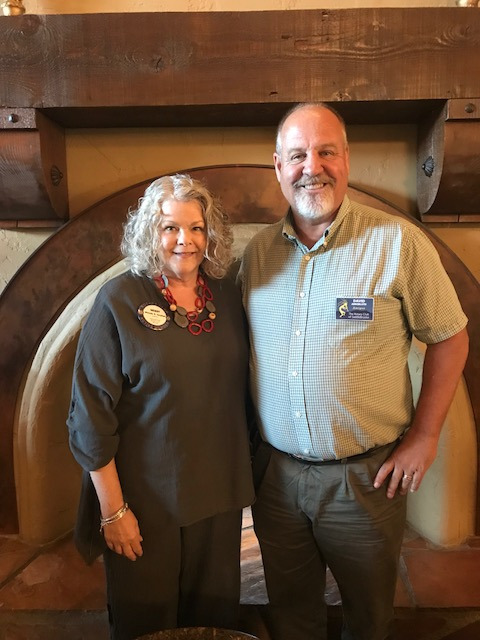 Membership chair, Wendy Guyton, gives a warm SaddleBrooke welcome to our newest transfer, Phil Barney. Phil was a Rotarian in Montana before moving to SaddleBrooke. We are so glad to have Phil join our club! 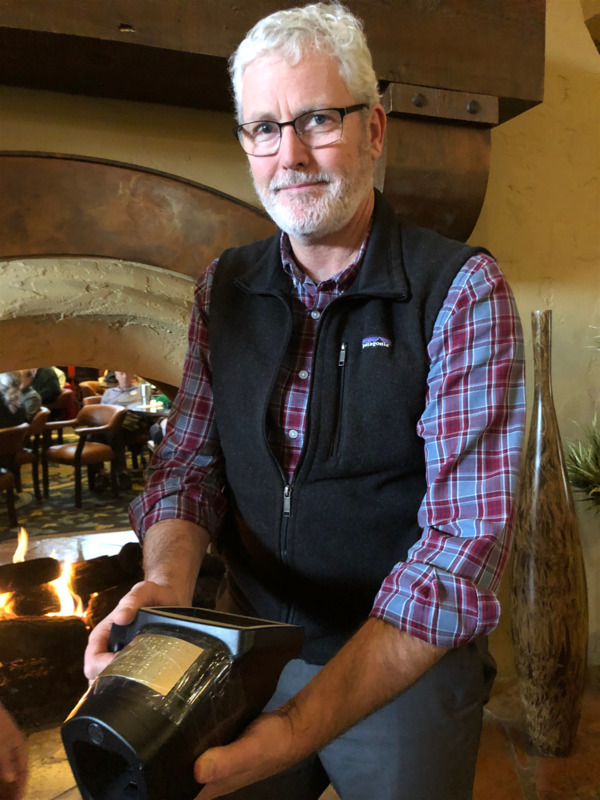 Congratulations, Mark Miller! 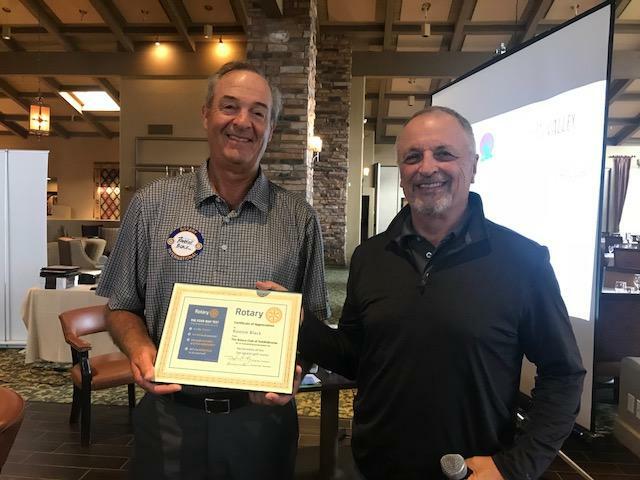 Mark was selected the "Rotarian of the Quarter" by President, Doug May. You can see the Rotarian of the Quarter recognition pin on Mark's collar. 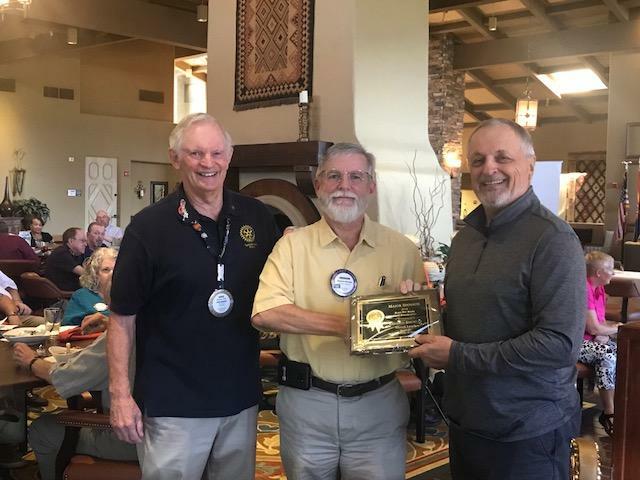 Mark has done incredible work on our International Grant from Rotary International, which will supply more than 20,000 students in Nogales, Mexico with clean drinking water in their schools. Mark is the owner of MJM Income Tax in Catalina! Congratulations, Mark! Our club is so fortunate to have you as a member! The month of January was closed out with another powerful speaker. Ed Treick spoke on how we can make a difference. Ed said he has had this speech in his head for almost a year. He provided an abundance of ideas on how we can make a contribution to others. Thank you, Ed. You shared so many marvelous insights and ideas! agreed to do all testing free of charge. and District 5500, the $18,000 raised was increased to $54,000. for getting this project underway with his funding and ideas more than 5 years ago. 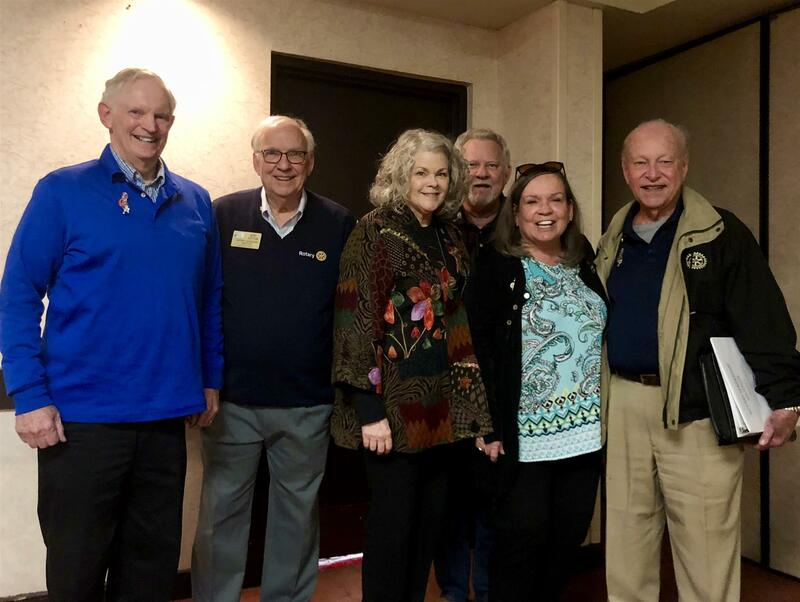 Eight members of The Rotary Club of SaddleBrooke participated in the Rotary Leadership Institute held at the Viscount Suites last Saturday. Braving the early morning chills of O Dark Hundred, these members enjoyed a great day of fellowship and learning! The venue had wonderful accommodations and the food was incredible. 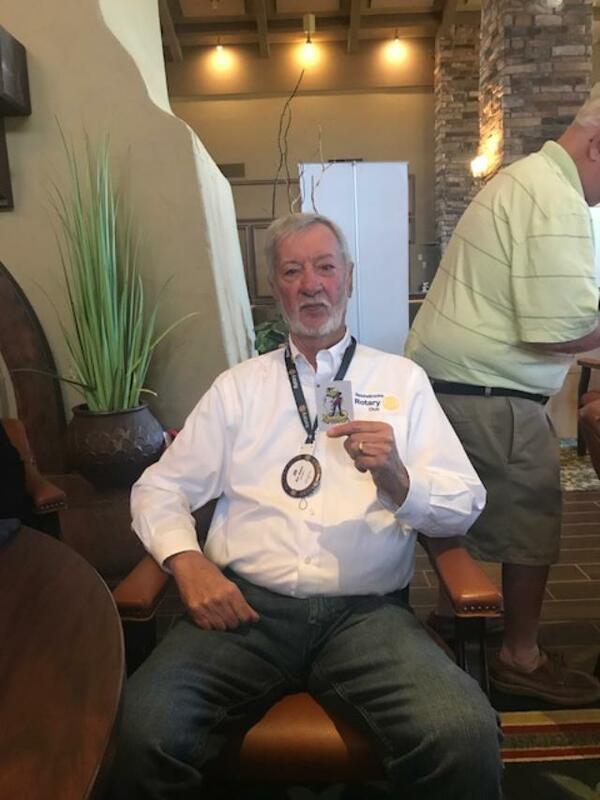 Joe Guyton (treasurer) heads up RLI for District 5500. Wendy Guyton (Membership Chair) graduated last year, but she still hangs around and handled registration. 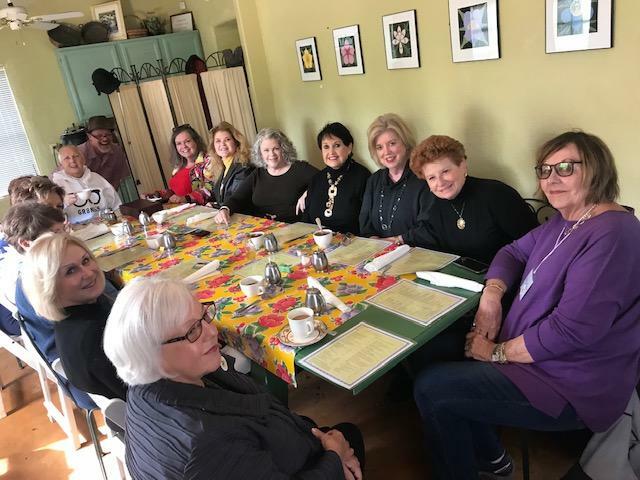 Also attending this year were Doug May: President, Barbara Barr: President Elect, George Corrigan: President Nominee, Paul Herr: Foundation Treasurer, Sheila Tuhy: Program Chair, and Julia Young, Public Relations and International Grant Committee. Left to right are: Doug May, Joe Guyton, Wendy Guyton, Paul Herr, Barbara Barr, and George Corrigan. Not pictured are Sheila Tuhy and Julia Young. 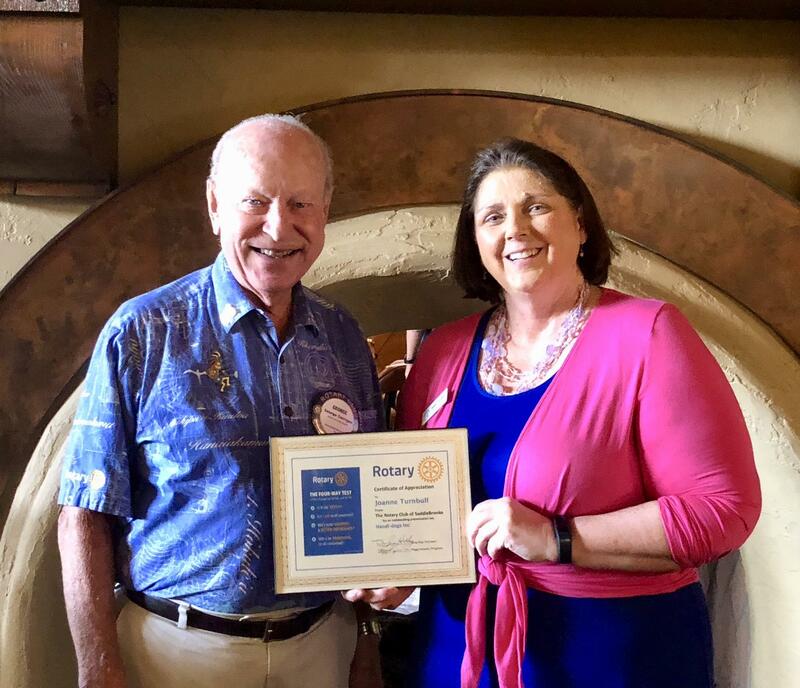 CONGRATULATIONS Paul Herr and Julia Young, two of the most recent graduates of Rotary Leadership Institute (RLI). 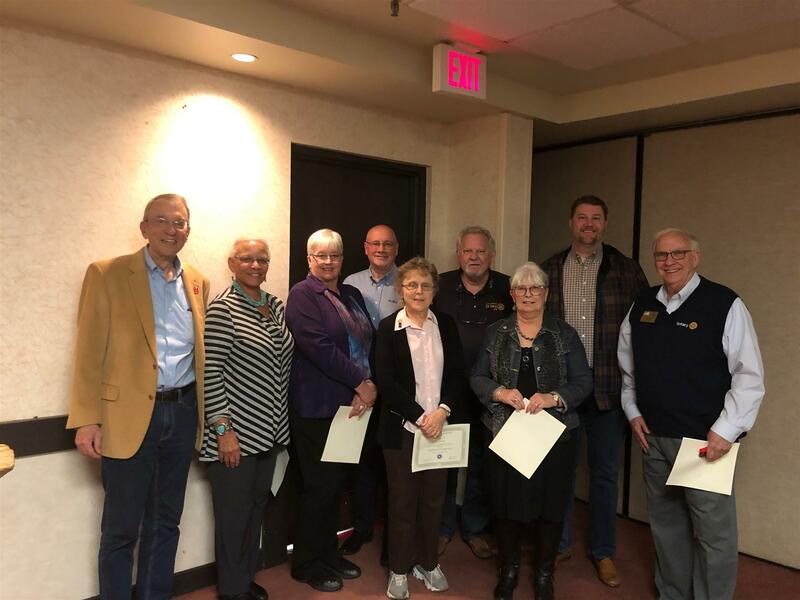 District Governor, Kirk Reed, and RLI Chair, Joe Guyton, helped the newest graduates of RLI celebrate. RLI consists of training at 3 levels of leadership. Paul and Julia have completed all three sessions of the leadership program. 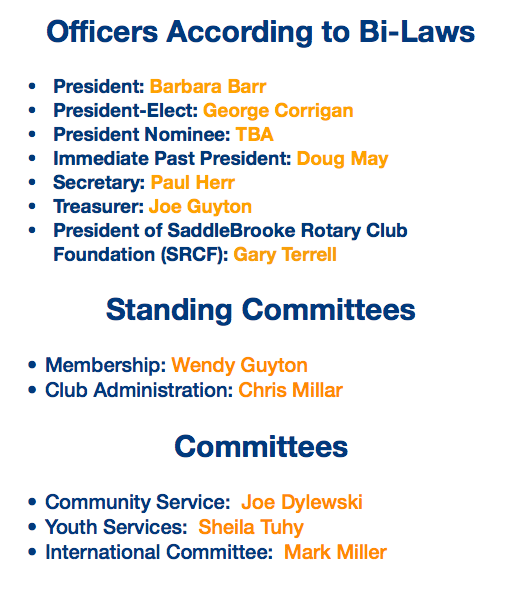 Our club is so fortunate to have these members as our club leaders. District Governor, Kirk Reed is far left. Paul Herr is hiding in the back row next to the tallest guy. Joe Guyton is on the far right. Julia was not able to stay for the photo. Congratulations to our graduates, Paul and Julia! We're so proud of you! A HUGE Rotary Club of SaddleBrooke THANK YOU to Joe and Wendy Guyton for a fabulous Rotary Leadership Institute (RLI). 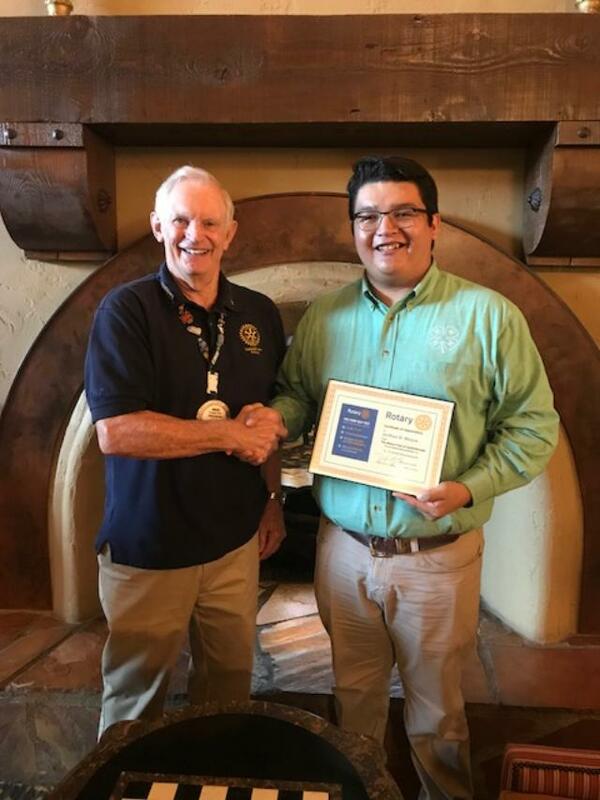 The Rotary Club of SaddleBrooke is proudly represented in District 5500 by Joe Guyton, who leads the RLI program for the entire district. 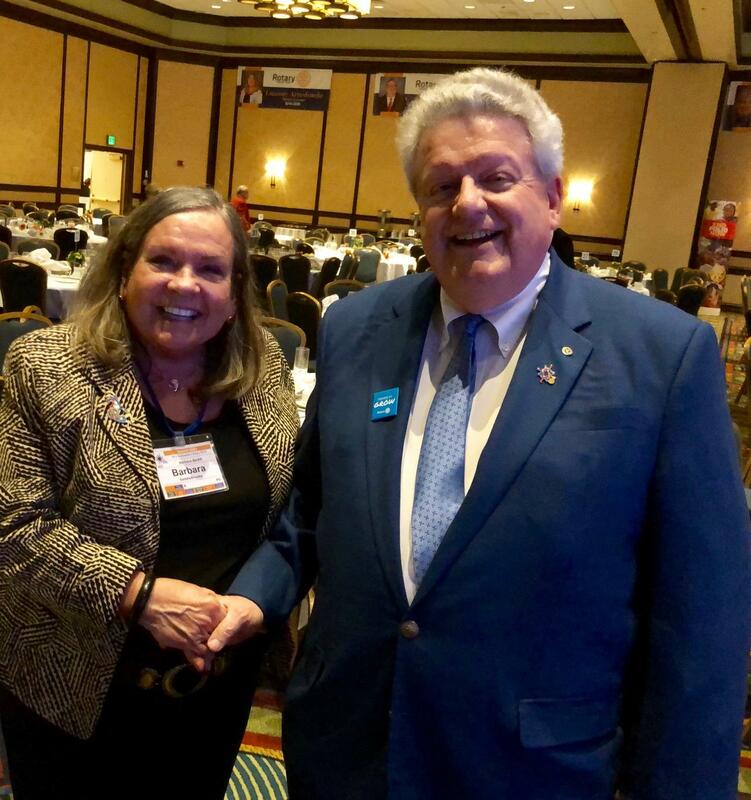 During the graduation ceremonies, District Governor Kirk Reed thanked Joe for taking a sleepy little program and turning it into an incredible training event. Joe's sidekick, Wendy, was in charge of registration. The two of them warmly welcomed attendees from all over District 5500. 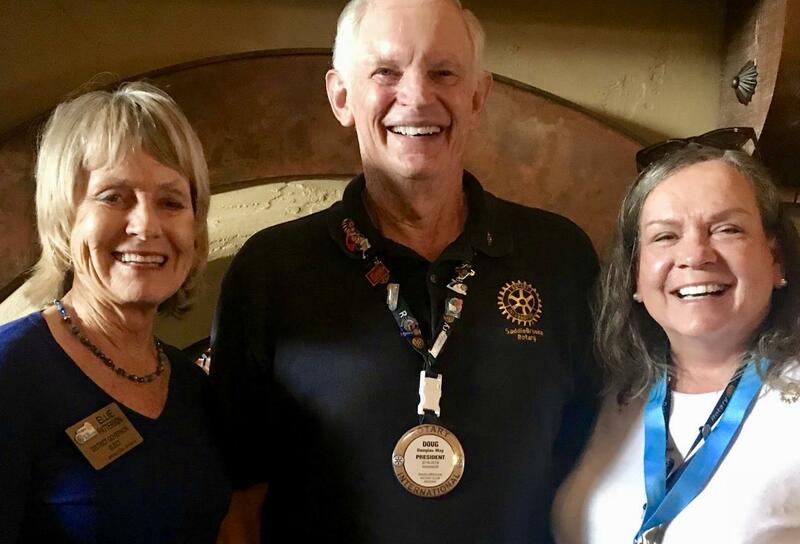 I can't begin to imagine how early this two got up to travel to Tucson and set up this outstanding Rotary event! 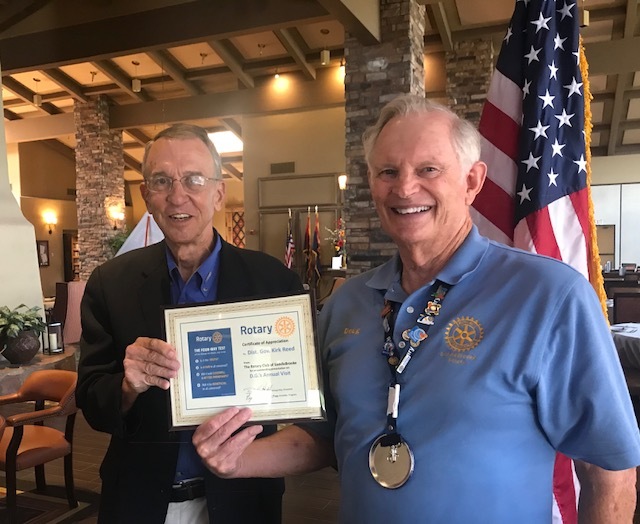 A warm Rotary Club of SaddleBrooke welcome to our newest Amigo, Gerald Baird. Gerald is a charter member of his home club back in Washington, and lives in SaddleBrooke half the year. 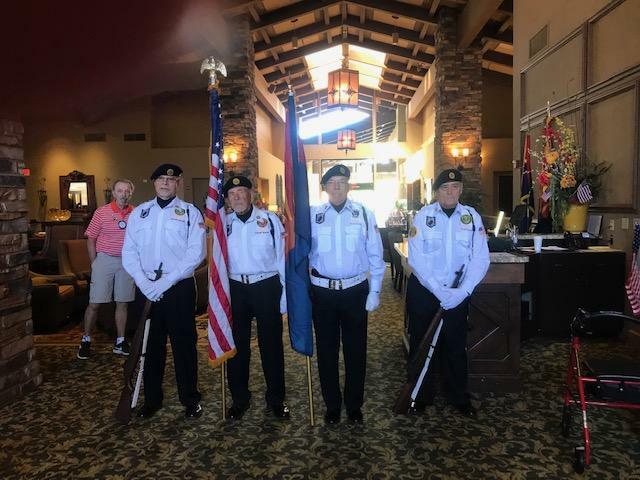 The Amigo program is a great way for snowbirds to remain members of their home club while getting involved with our club while they are living in SaddleBrooke. To learn more about the Amigo program, contact our membership chair, Wendy Guyton at at 520-404-5712 or wguyton17@gmail.com. 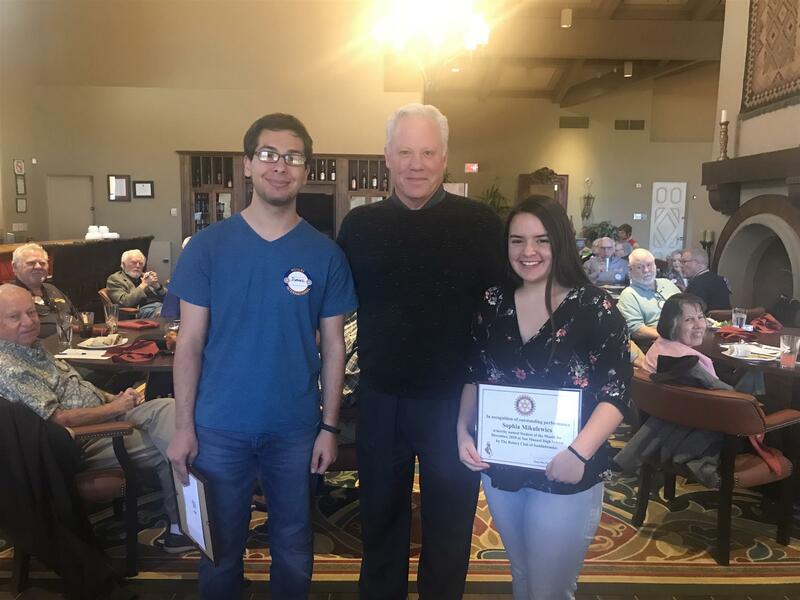 Each month, The Rotary Club of SaddleBrooke recognizes an outstanding student attending San Manuel Junior Senior High School. The students are treated to time off from school and school cafeteria food while they dine with us at the SaddleBrooke Clubhouse. In addition to a certificate, they also receive a cash award from the club. 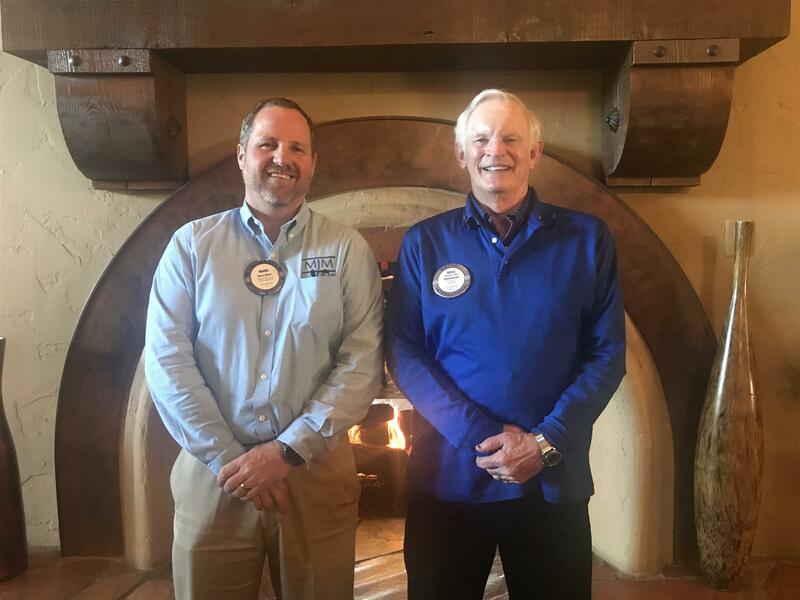 Joe Dylewski, Board Member at Large and Financial Advisor at Edward D. Jones, and Dave Jungbluth, Rotary Amigo and Counselor at San Manuel Junior Senior High School, head up the program. Joe Dylewski is pictured with our awardees for November and December. 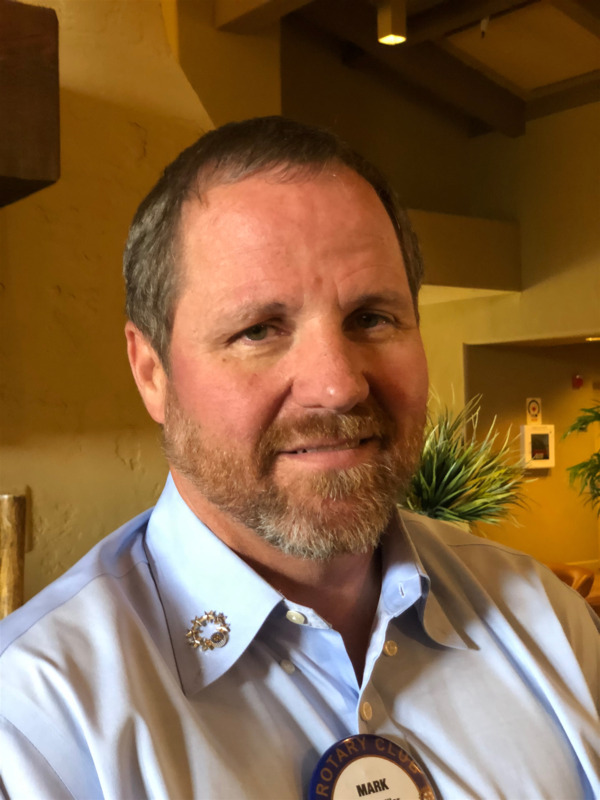 Mark Miller of MJM Income Tax in Catalina, AZ shared tips on the new 2019 tax laws. 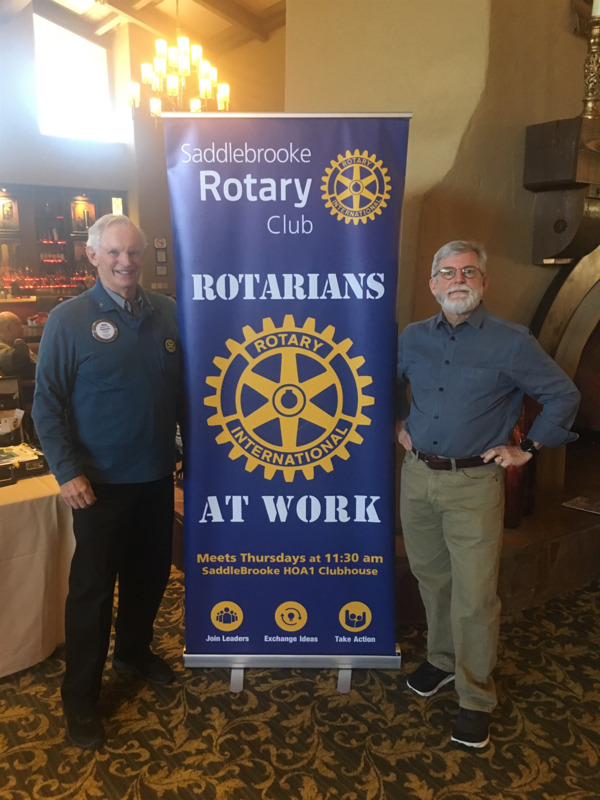 Left to right: Mark Miller and Doug May, President of The Rotary Club of SaddleBrooke. both time and money over the past years. 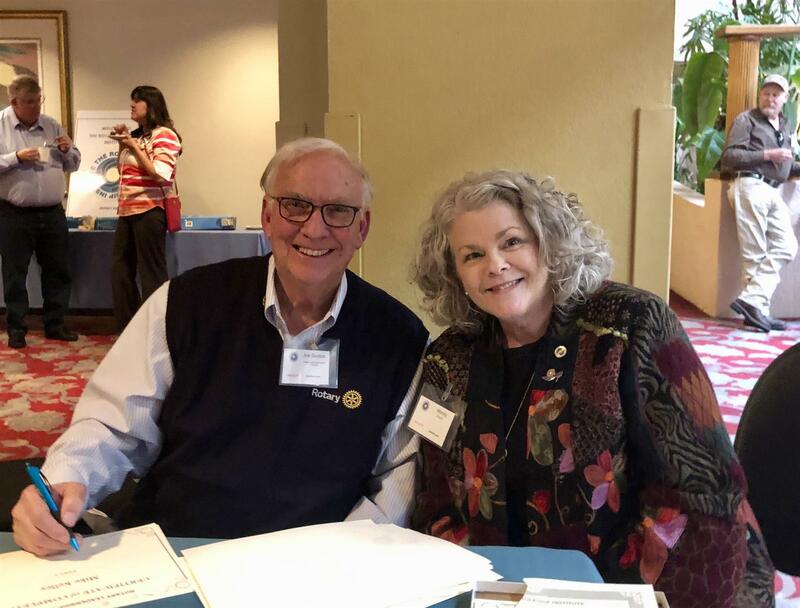 Register by January 1st to get a state room in the Rotarian area. After January 1st, any rooms that are not reserved will the open to the public. If you register after January 1st, your stateroom may not be close to the Rotarian area. 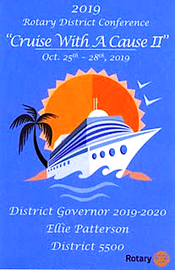 Enjoy fun in the sun, fellowship, great speakers and breakout sessions at the 2019 Destination District Conference while cruising down to Ensenada, Mexico on the ship “ Inspiration.” We sail from beautiful Long Beach, CA to Ensenada, B.C., Mexico, departing Friday, October 25th at 6:30 pm and returning Monday at 7:00 am October 28th, 2019. (It’s a week after the car show!). 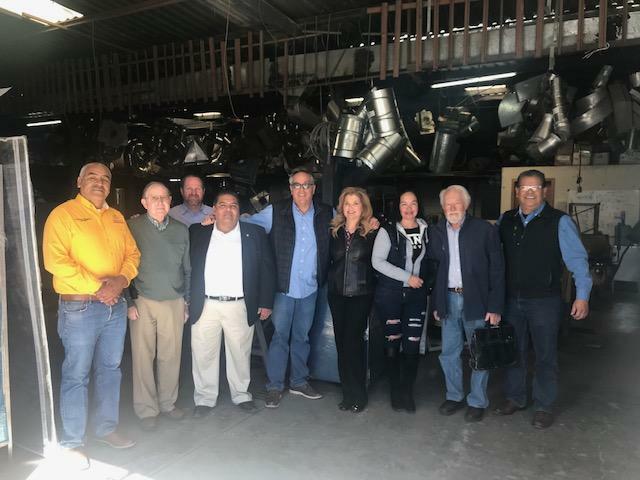 Experience the internationality of Rotary while working side by side with fellow Rotarians and Rotaractors on a project in District 4100 while docked in Ensenada. Wine-tasting tours, shopping and exchanging new ideas with local Rotarians can also be experienced. Ocean breezes, great food (24 hours a day), evening strolls on the deck with a gorgeous Baja moon overhead, renewing old friendships and making new acquaintances, what could be better? The deposit is $50.00 -$100 depending on size of cabin. Ocean view cabins are $454-$484 and inside cabins are $404-$409. 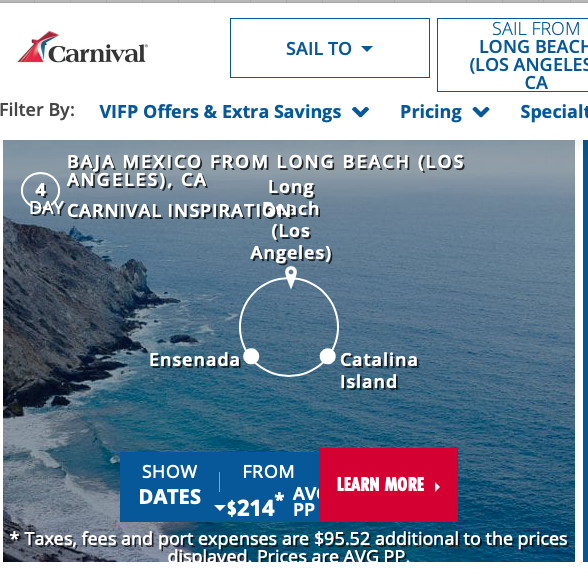 This reasonable price for the entire trip is all-inclusive. (alcoholic beverages not included). Sorry folks! I tried. 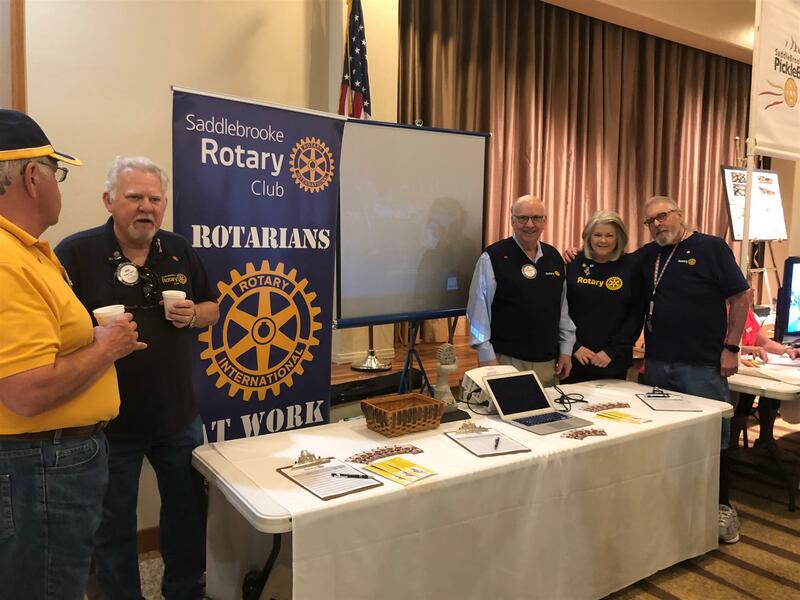 Members of the Rotary Club of SaddleBrooke enjoyed spending Saturday morning together while we showed off our club at the SaddleBrooke Recreation and Activities Fair. 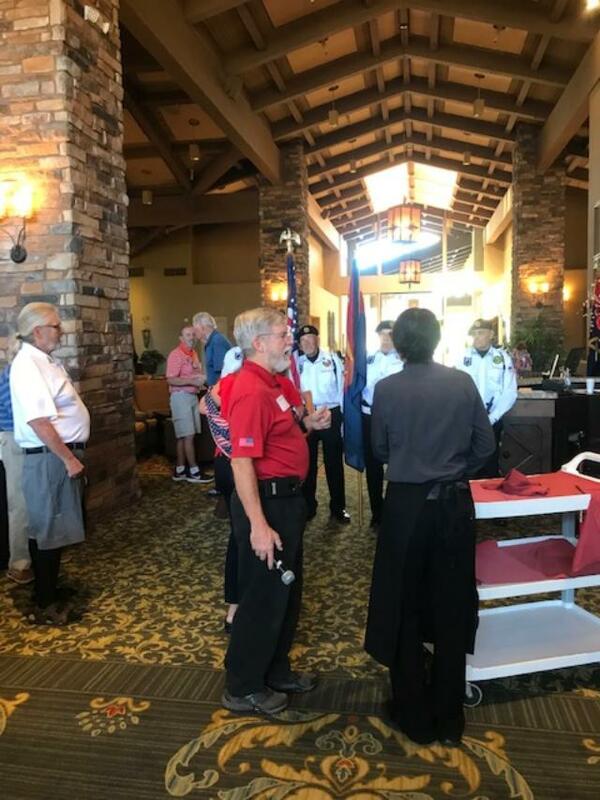 Many thanks to our members who represented the club and who organized the event: A.T. Barr, Barbara Barr, Joe Guyton, Wendy Guyton, Paul Herr, Fred Lowy, Doug May, Ned Selinsky, Tom Simester, Tim Morsani, and Julia Young. 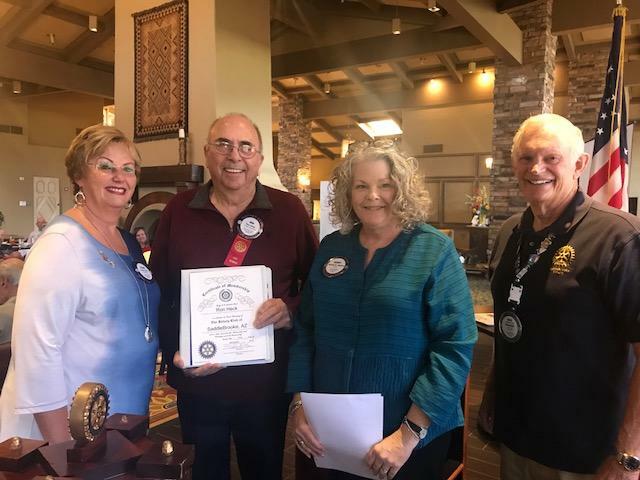 Pictured left to right are a visiting Rotarian, Paul Herr, Joe Guyton, Wendy Guyton, and A.T. Barr. Sheila Tuhy shared heartfelt stories of motherhood. Sheila and her late husband, Ed, raised a special needs daughter with Cerebral Palsy. Their daughter taught Sheila and Ed many special life lessons. 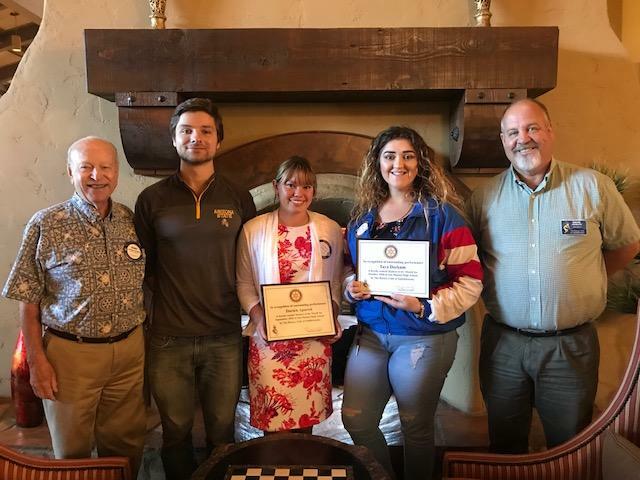 The Rotary Club of SaddleBrooke is very proud of our Interact Club at San Manuel High School. 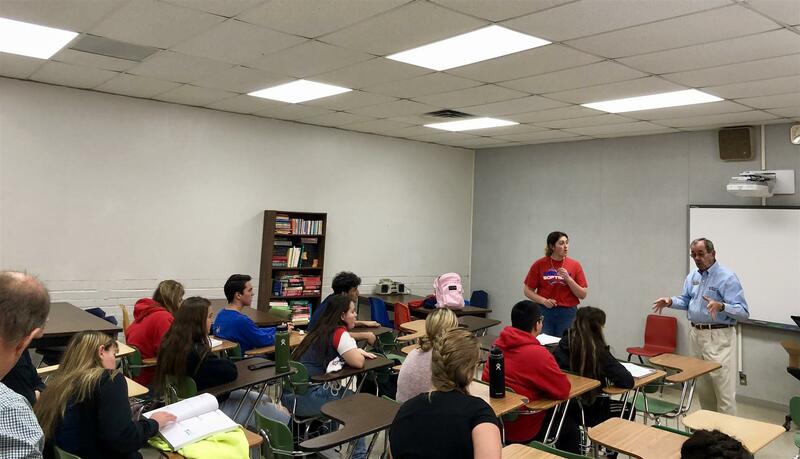 Our Interact Club of San Manuel is hard at work. 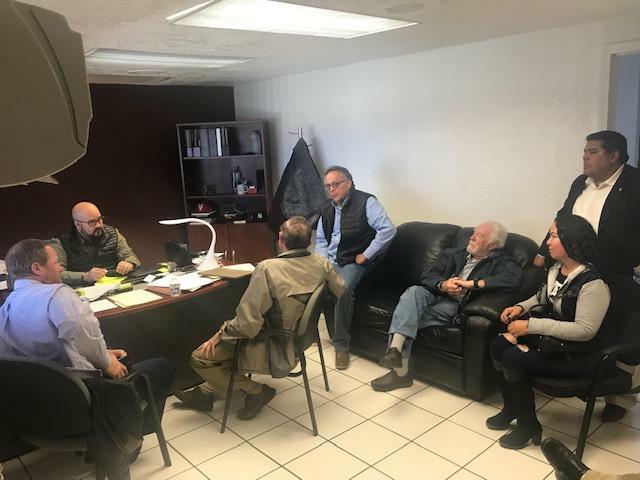 They have been collecting toiletries and personal care products to donate to the food bank, and are planning several other philanthropic events. During this meeting, they met with Lou Rouch from Little Hooves Big Hearts. The students will spend 2 Saturdays helping out at Little Hooves Big Hearts. 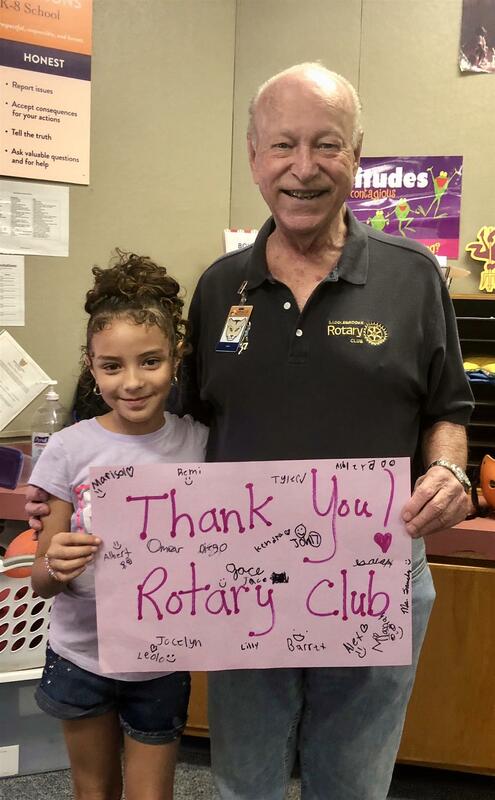 The Rotary Club of SaddleBrooke passed out t-shirts to the Interact Club. Dr. Dan Twelker brought SPOT to our meeting on Thursday, January 10th. SPOT is the optical equipment that the SaddleBrooke Club of Rotary helped to purchase for Volunteer Optometrists Serving Humanity, or VOSH. SPOT was purchased to honor Dr. Ed Tuhy, one of our long time members. 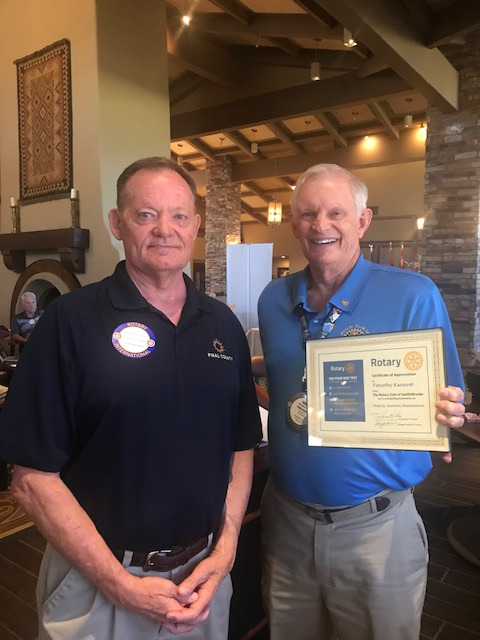 Jim Lamb, the Polio Chairperson for District 5500, awarded The Rotary Club of SaddleBrooke a certificate for our Polio donations. Accepting the award for the club is Barbara Barr, secretary and President Elect. Janie Bottai of Vital Moves explained the four areas of fitness that we need to address. This was our first meeting of the new year, so it was such an appropriate topic. 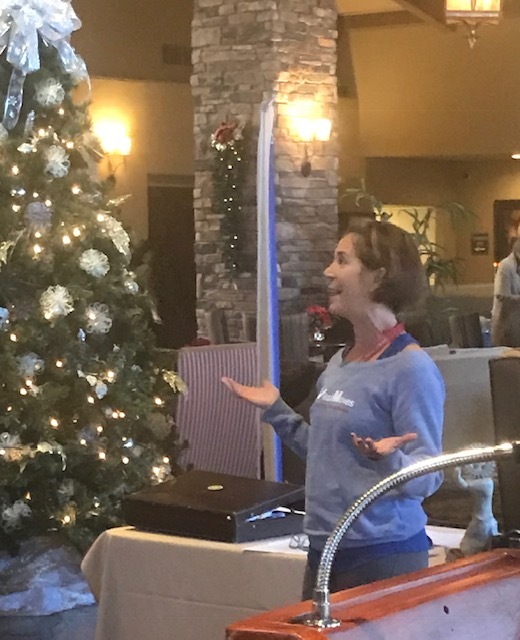 A very special thank you to Sheila Tuhy for hosting an incredible holiday social for the club. 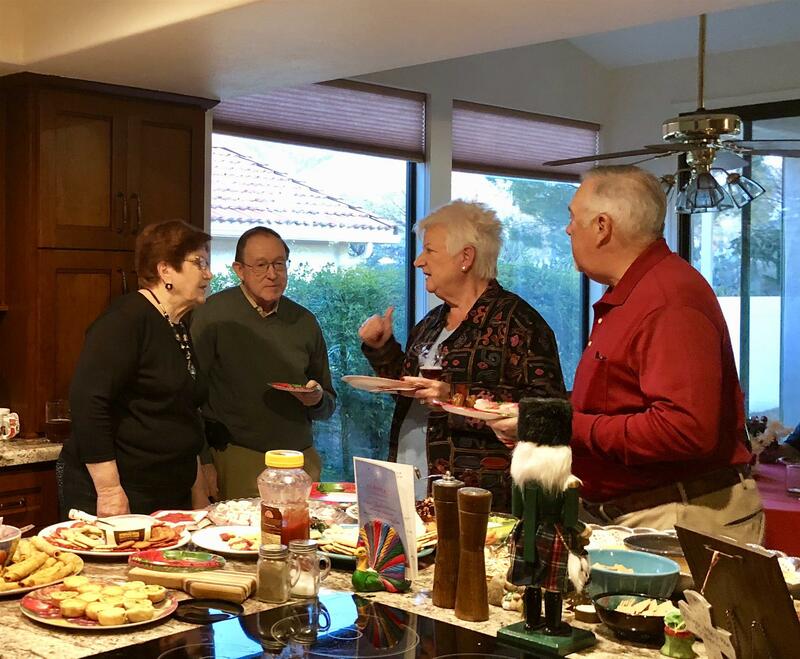 She not only was the "Hostess with the Mostess", but she also invited prospective members. Way to go Sheila! The annual Christmas Party was a great success. A very special thank you to Elaine Terry who headed up the project following Cammy's fall. In addition to a lot of support from husband, Don Terry, Elaine had two outstanding side-kicks, Wendy and Joe Guyton. Many thanks to this fabulous team for a tremendous party! 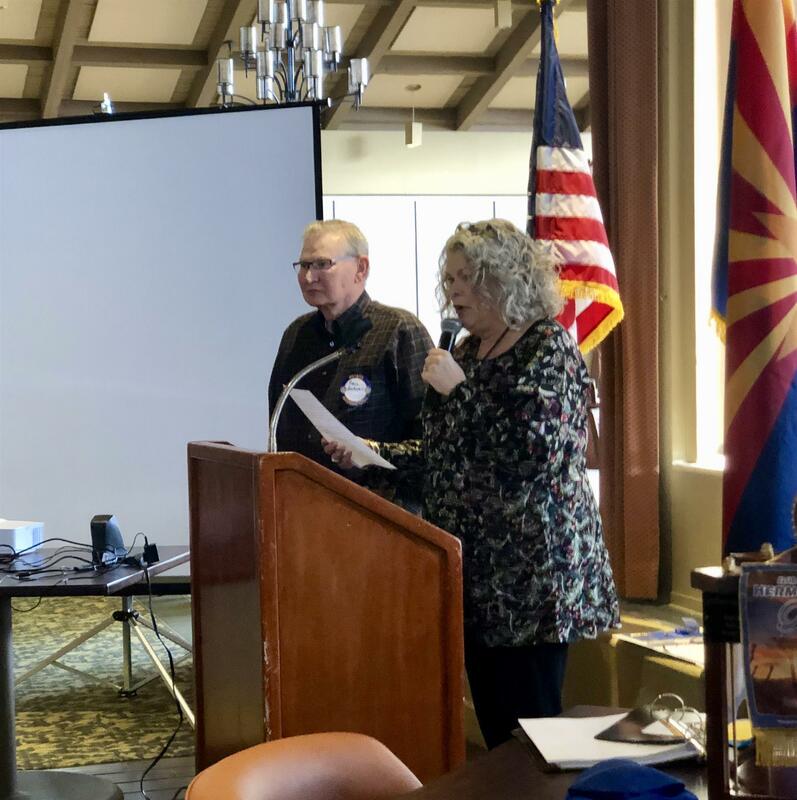 Randy Brooks, District Charitable Fund Chair, and Mary Strauss, Assistant Area Governor from the Marana Rotary spoke about the Cameroon Economic Development & Education Project. Wendy Guyton was surprised at our last meeting as she received a Paul Harris award. Wendy has served as Program Chair, and currently serves as Membership Chair and Liaison for the Interact Club. Wendy has also served as the chair of two fundraisers which raised money for arts in the local schools and SaddleBrooke Senior Village. 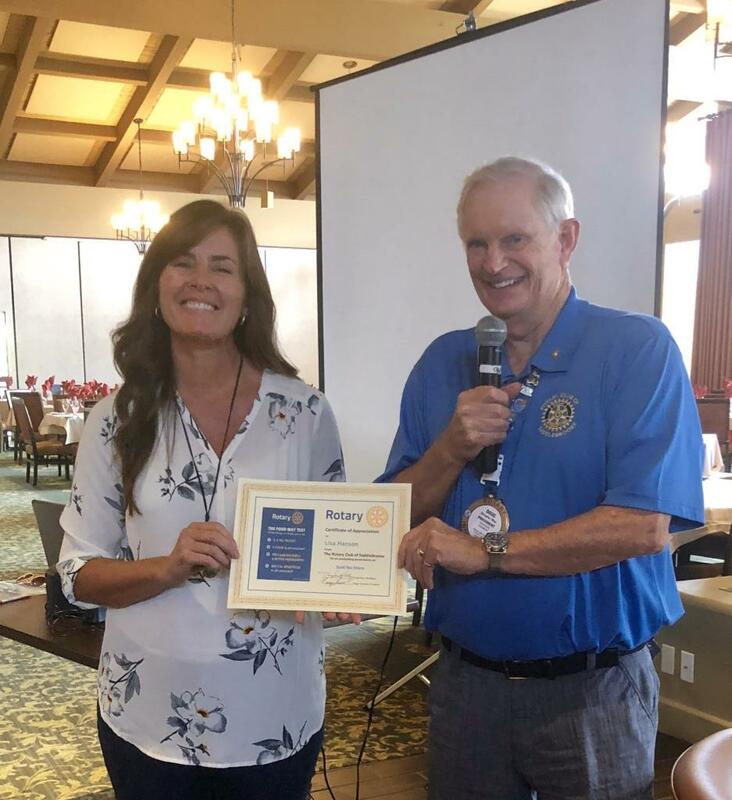 When it comes to a Rotary function, event, or project, Wendy is always there. Our club is definitely blessed to have Wendy as a member! 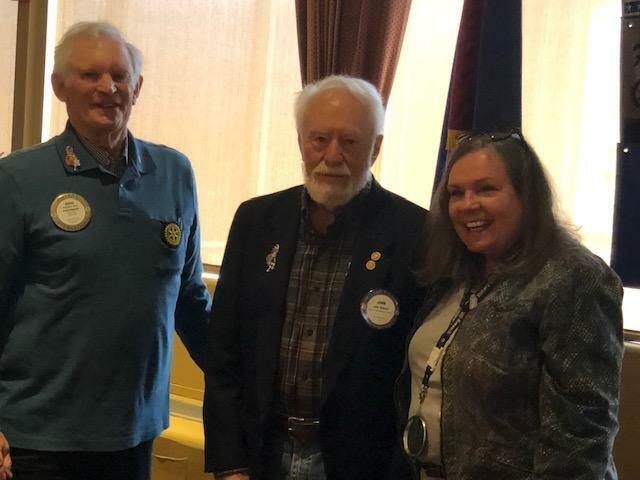 Pictured left to right are Doug May, President, Wendy Guyton, Newest Paul Harris, and Tim Morsani, Chair of the Rotary Foundation. Remembering our fellow Rotarians, Bev Porras and Nancy Haugh. 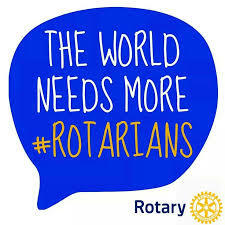 Both Rotarians helped to make the world a better place! 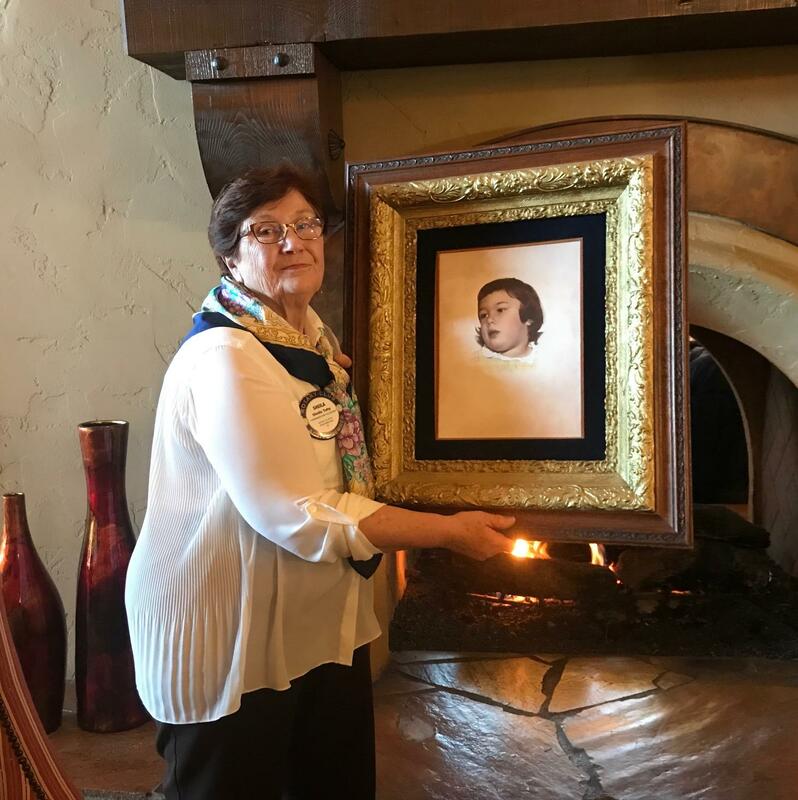 We will remember Bev Porras' smiling face and helping hand. Most recently, Bev had been the head of the Family of Rotary. 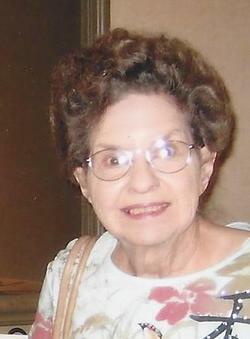 She diligently sent cards to fellow Rotarians for birthdays and illness. She was a frequent visitor at the National Parks Store, where she attended many lectures. 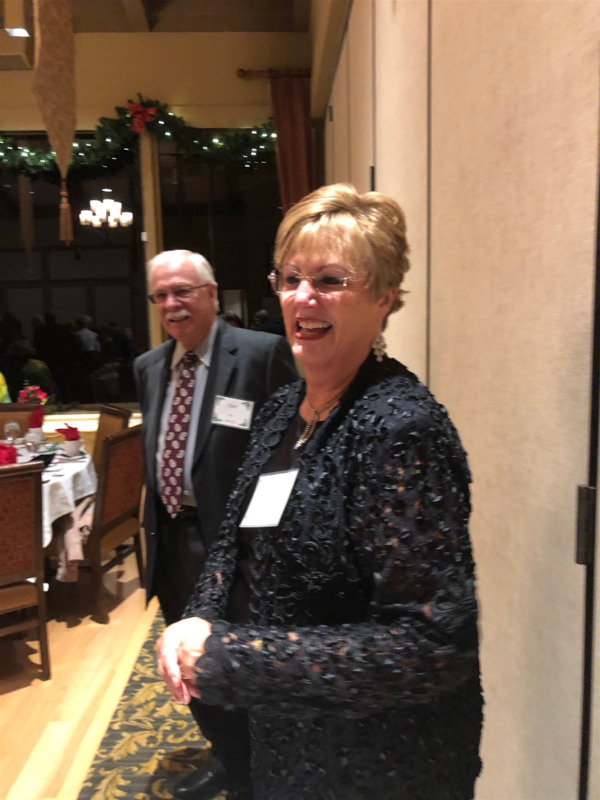 Nancy was a former president of the club and attended our Christmas Party last year as we celebrated our 20th Anniversary. Nancy drove herself from Vail for the party! What a trooper. 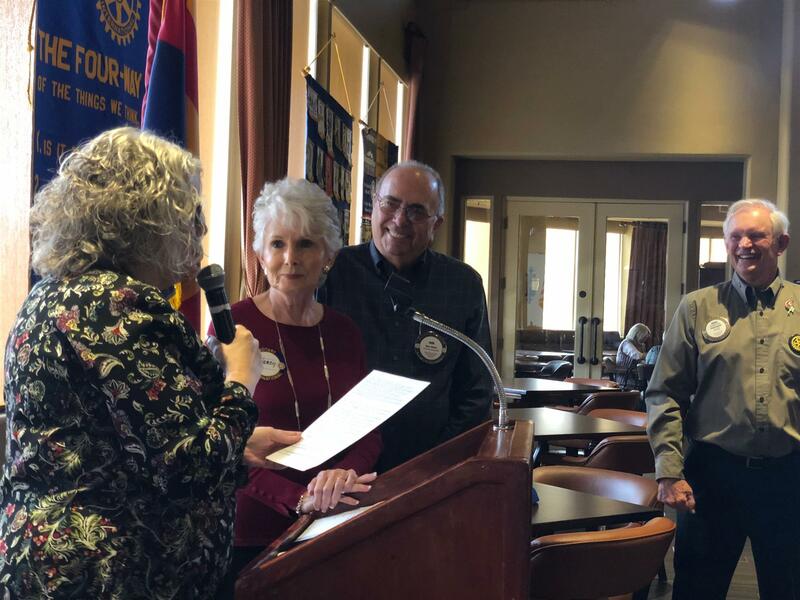 Members of the Rotary Club of SaddleBrooke, IMPACT of Southern Arizona Board, 1st responders of the Golder Ranch Fire Department, the Elks Club, and Basha's made Thanksgiving a little brighter for many people in Catalina and surrounding communities. The club helped to distribute turkeys, pies, potatoes, and all the sides for Thanksgiving. Many thanks to Board Member Joe Dylewski for setting up the event. We love helping every year! Mile 76 of 103! Mark Miller rides again in the Tour de Tucson to raise funds to end Polio! 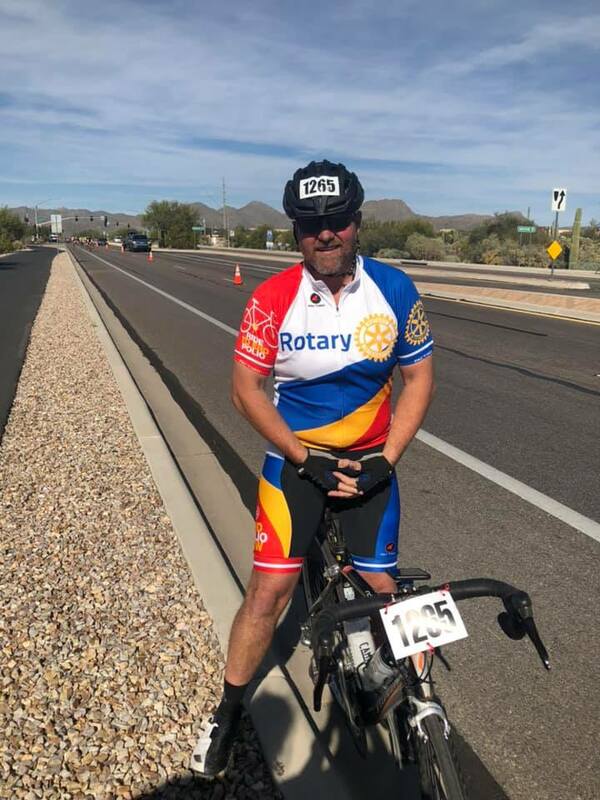 Thank you, Mark, for representing our club and participating in such an important event for Tucson and for Rotary! 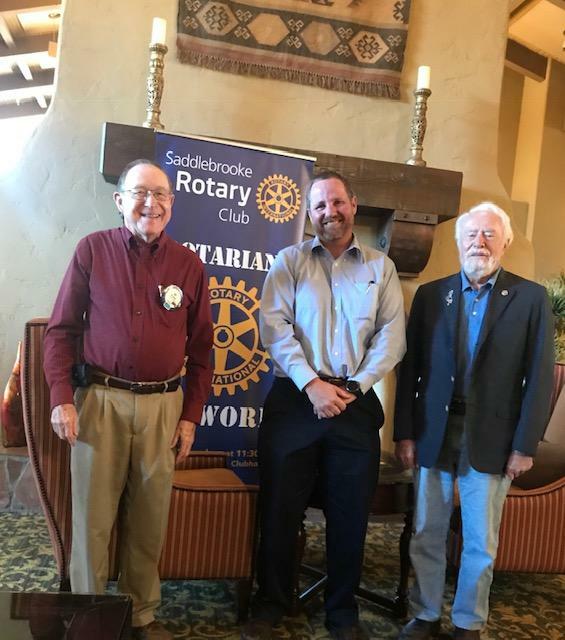 The Rotary Club of SaddleBrooke is excited to welcome Carl Moser as our newest member. 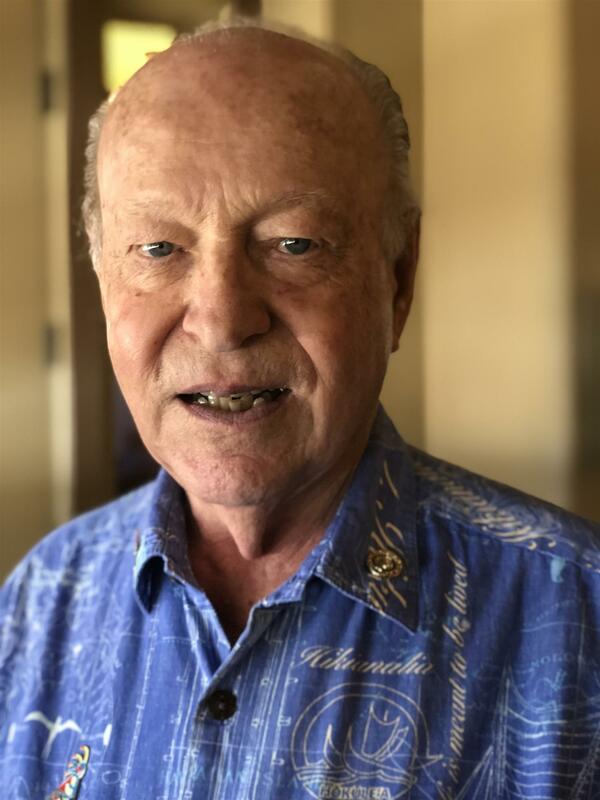 Carl served in both World War II and in Korea. He also owned and operated Moser Aircraft Sales for 30 years. Welcome, Carl! We're so happy to have you as our newest member! 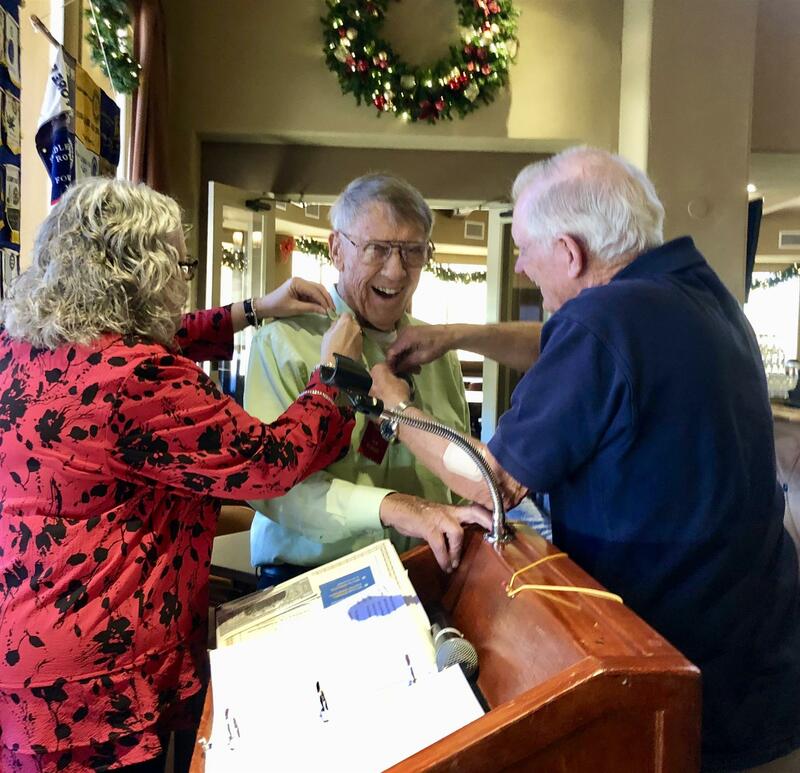 Pictured: Wendy Guyton pins the Rotary pin on Carl's collar, while President Doug May places the Rotary name tag on Carl's shirt! Many thanks to Barbara McClure for speaking to us about IMPACT of Southern Arizona. Barbara has been working with the organization since she moved here in 2008. IMPACT has added many new services and continues to look for new opportunities to help in the community. For those interested in serving their community, IMPACT offers plenty of opportunities! 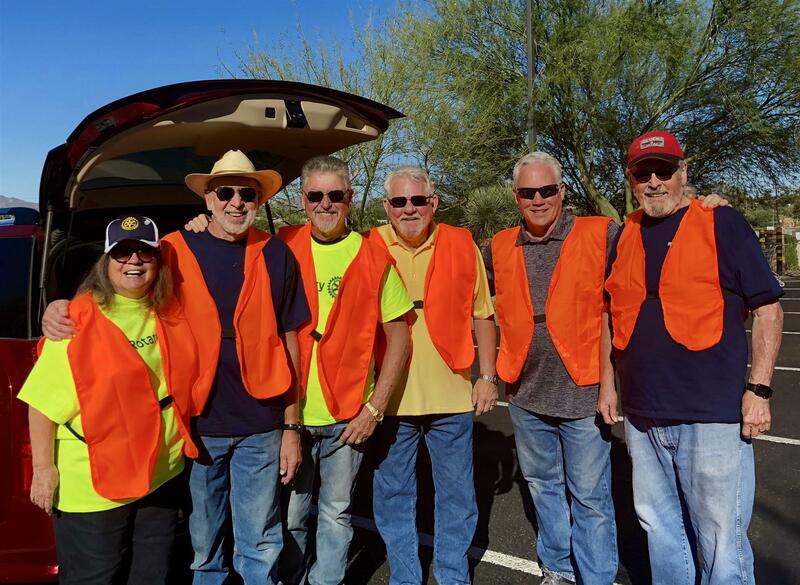 Doug May, Rudi Faller, Ned Selinsky, Chris Millar, Barbara Barr, Jim Fry, Paul Herr, Joe Dylewski, and A.T. Barr spent Saturday cleaning up Golder Ranch Road. Chris Millar organized the event, complete with safety vests, tools, and even cold water. Pictured left to right are: Barbara Barr, Jim Fry, Chris Millar, Paul Herr, Joe Dylewski, and A.T. Barr. Not pictured are Doug May, Rudi Faller, and Ned Selinsky. her Major Sponsorship of our Fore For Kids Golf Tournament. thought provoking presentation to a crowded room. Barbara McClure, Executive Director of IMPACT of Southern Arizona will speak on Thursday, November 15th. Learn more about aging in place in the home you love as well as opportunities to make a difference in our community! We could not do without our Major Sponsors for Fore For Kids. extreme generosity year after year. 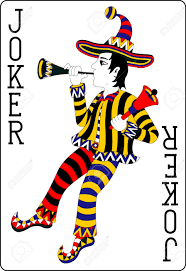 Congratulations Joe Jones our latest card game winner. 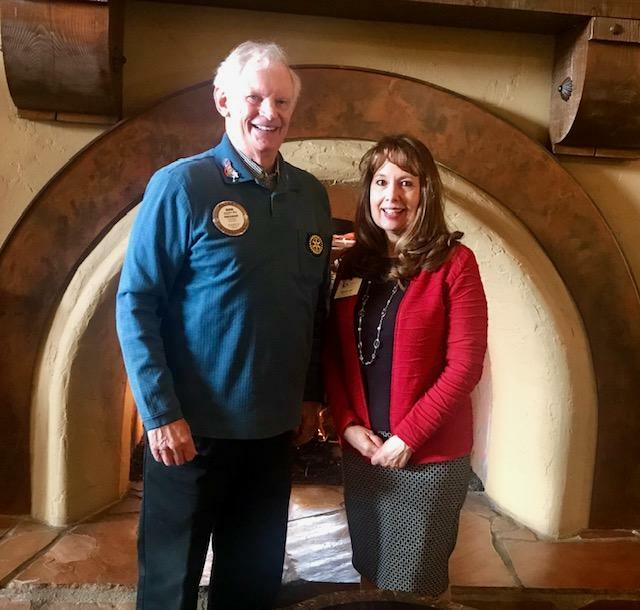 District Governor Nominee, Diana Ventura Goodyear, and her husband, Gordon, visited The Rotary Club of SaddleBrooke last Thursday. Diana shared information about upcoming district events and vocational scholarships. 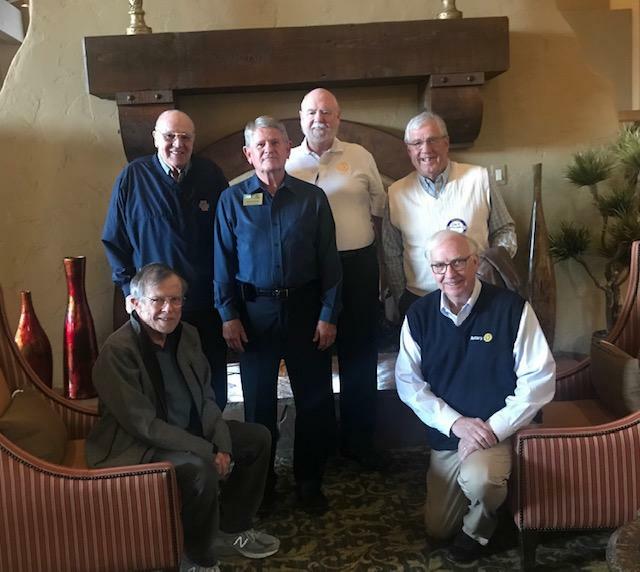 President Doug May welcomed them to the club. 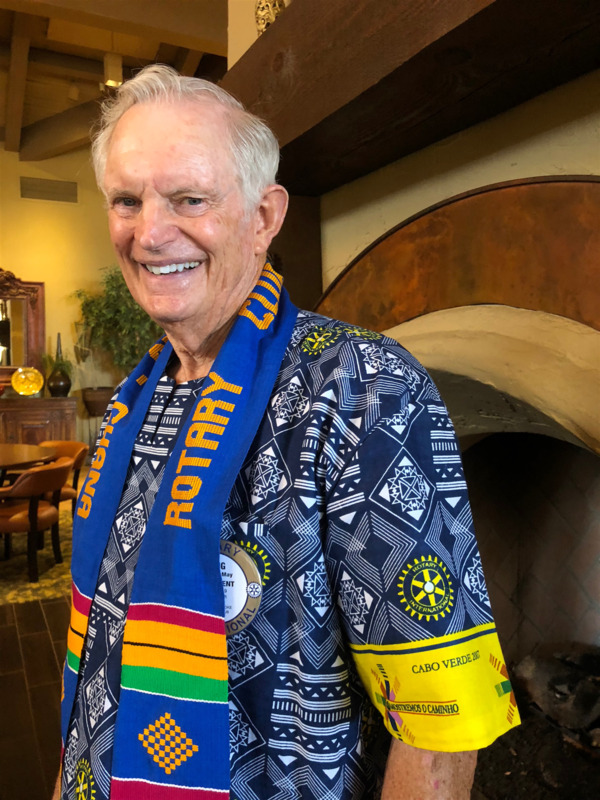 So far since the start of the new Rotary Year in July, we have had visits from our District Governor, our District Governor Elect, and now our District Governor Nominee. In December we will be visited by our Assistant Governor. 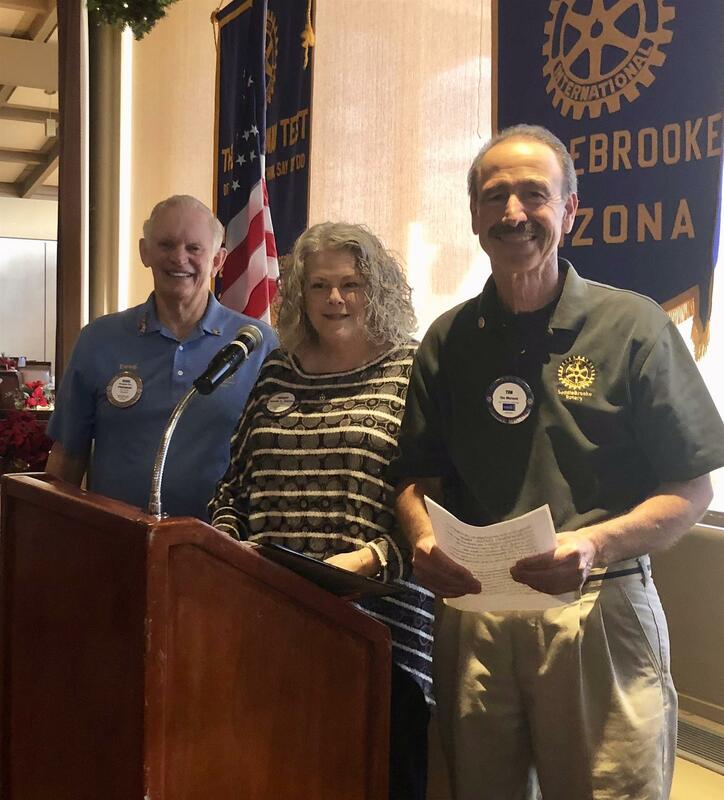 Members of the Rotary Club of SaddleBrooke sat riveted as attorney Rebecca Masterson described the needs of Arizona foster children. Rebecca and her non profit, GenJustice.org, represent Arizona children, but they are fighting for the rights of children throughout the United States. Left to right: Rebecca Masterson of Gen Justice, Club President Doug May, and Program Chair Peggy Knowles. 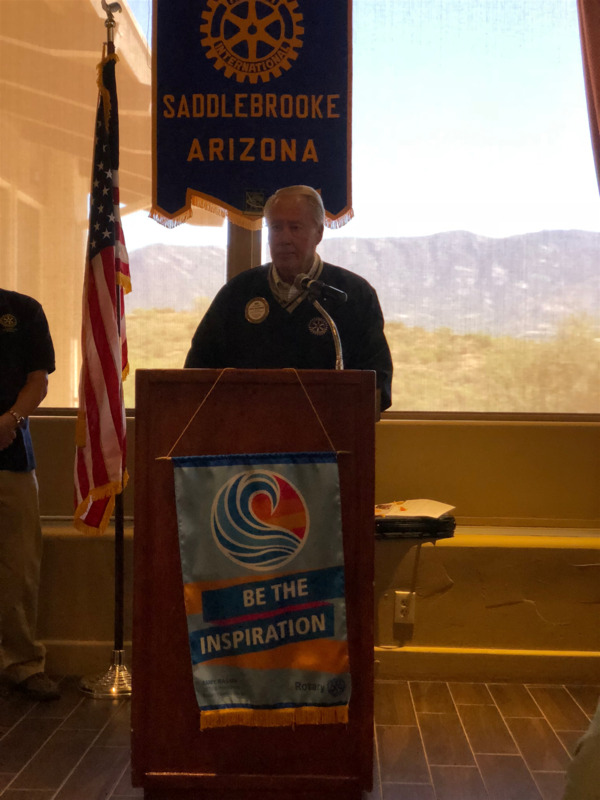 Former club president, Neil Deppe, presented district awards to the The Rotary Club of SaddleBrooke. 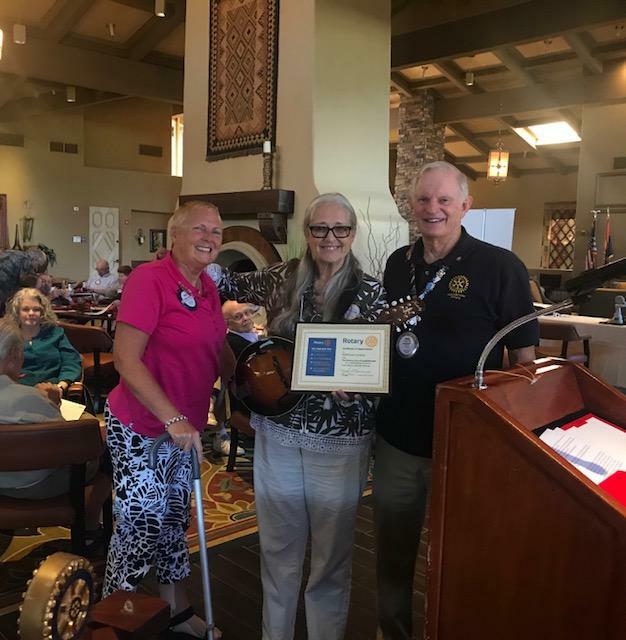 During the recent District Conference, The Rotary Club of SaddleBrooke was presented with 3 awards: International Services, Club Services, and a Paul Harris contribution for membership. Volunteer Work at the Southern Arizona Food Bank in Catalina. Saturday Morning "Get Er Done"
Welcome Dave Jungbluth. Our newest Amigo with Wendy Guyton. Congratulations to Darien and Taya for this honor. The best of luck to both of them as they pursue their higher education goals. Christmas came early for hundreds of elementary students in San Manuel and Mammoth. Members of the Rotary Club of SaddleBrooke delivered dictionaries and children's literature to students in the community. Left to right: George Corman, Elaine Terry, Chris Millar, Barbara Barr, and Jim Frye! as important today as it was then. as well as, his restoration of his Southern Arizona Club. 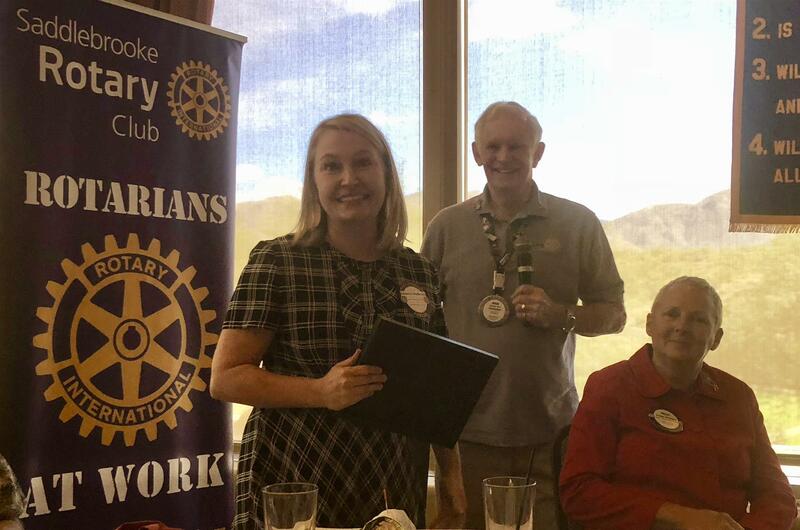 District Governor Elect, Ellie Patterson, visited the Rotary Club of SaddleBrooke on Thursday, October 11. Ellie had many accolades for the club and shared information on the up-coming "Cruise for a Cause." Left to right: Ellie Patterson, District Governor Elect; Doug May, President; and Barbara Barr, President Elect. 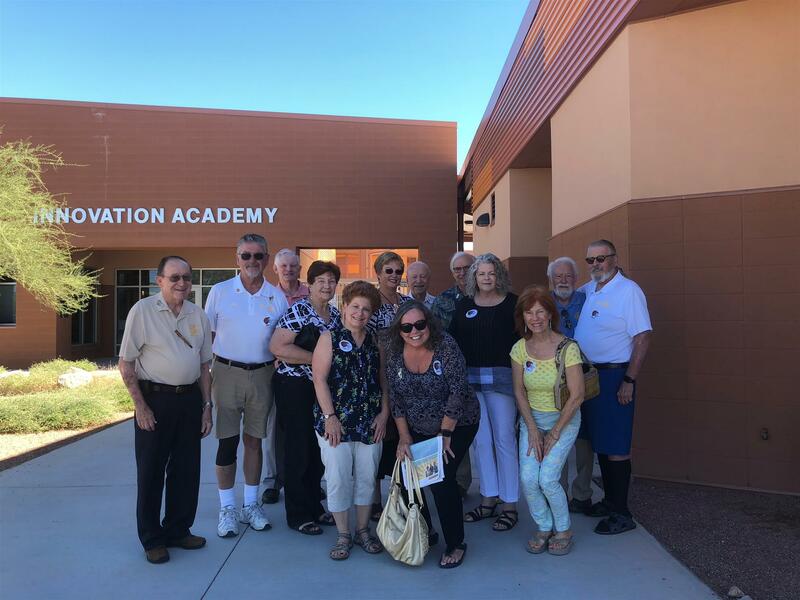 Members of the Rotary Club of SaddleBrooke toured the Innovation Academy in Oro Valley for an offsite meeting. Innovation Academy is s STEM (Science, Technology, Engineering, and Math) school that opened just last year. 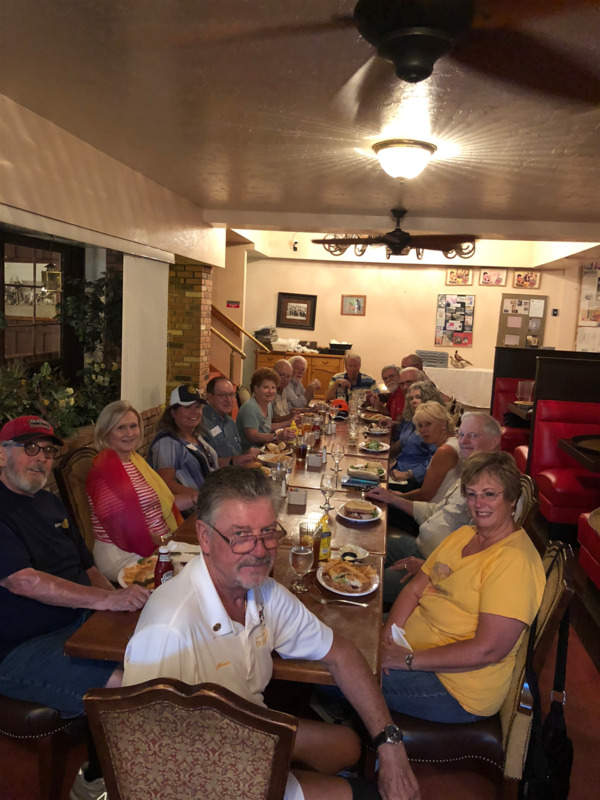 Members and Amigos of the Rotary Club of SaddleBrooke enjoyed their September 27th lunch meeting at the Oracle Inn in Oracle, AZ. The Oracle Inn treated us like Kings and Queens and even set up a a special room for us! 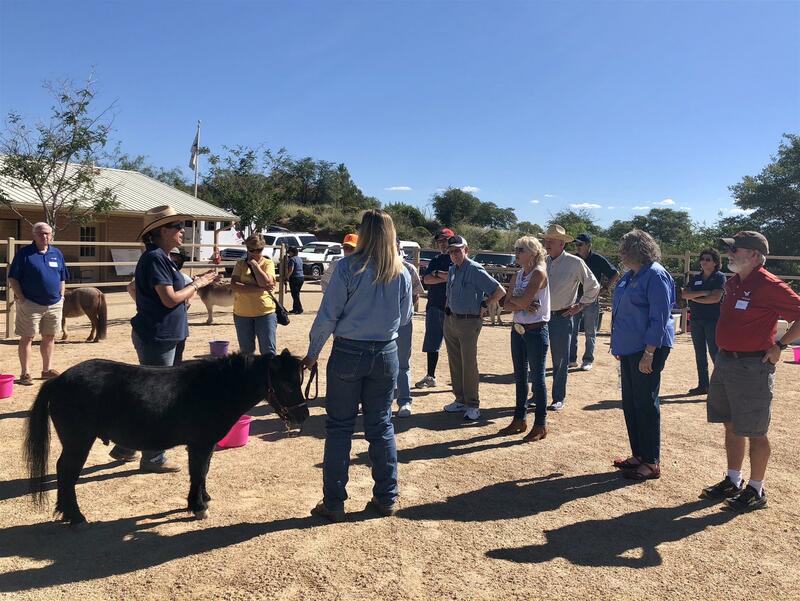 Members and Amigos of the Rotary Club of SaddleBrooke had a first hand experience with mini horses while visiting Little Hooves Big Hearts. The organization provides free therapy for children with disabilities and seniors. Little Hooves Big Hearts has been the recipient of funding from the SaddleBrooke Rotary Foundation for a number of years. Doug May shared his experiences with the Ghana Water Project. As a collaborative effort between the organization for engineers, the University of Arizona, and Rotary International, the projects provided water for those in need in communities in Ghana. George Corrigan received his Paul Harris Plus 8 pin. If you will take a look at George's collar, you'll see his new pin with 3 rubies. George says his secret to reaching all his Paul Harris goals is to use the monthly credit card plan. If someone contributes as little as $15 per month, they can reach their Every Rotarian Every Year goals. 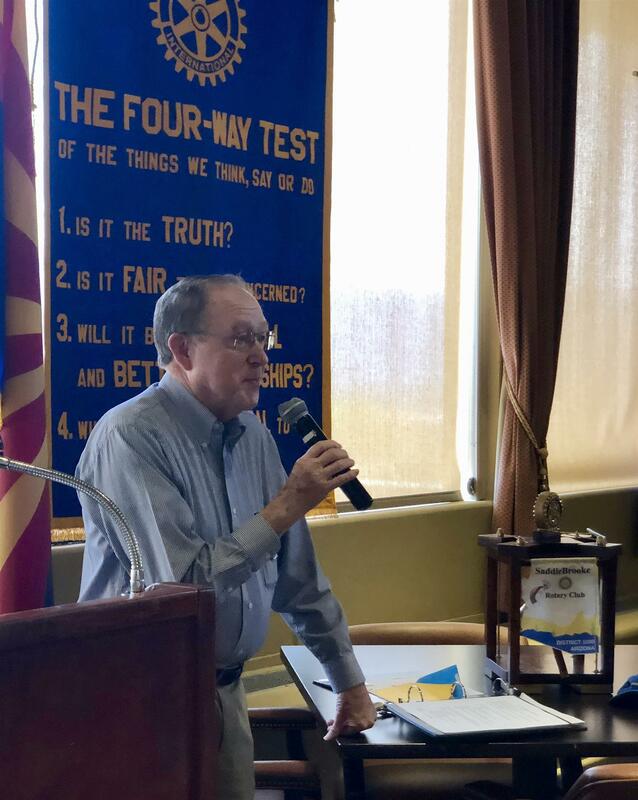 Pinal County Economic Development Program Manager, Tim Kanavel, was on hand to talk about the marketing efforts of his division. In 2017 Pinal County experienced 9% growth, which was the highest of any Arizona Counties. The future for our own Pinal County looks bright! 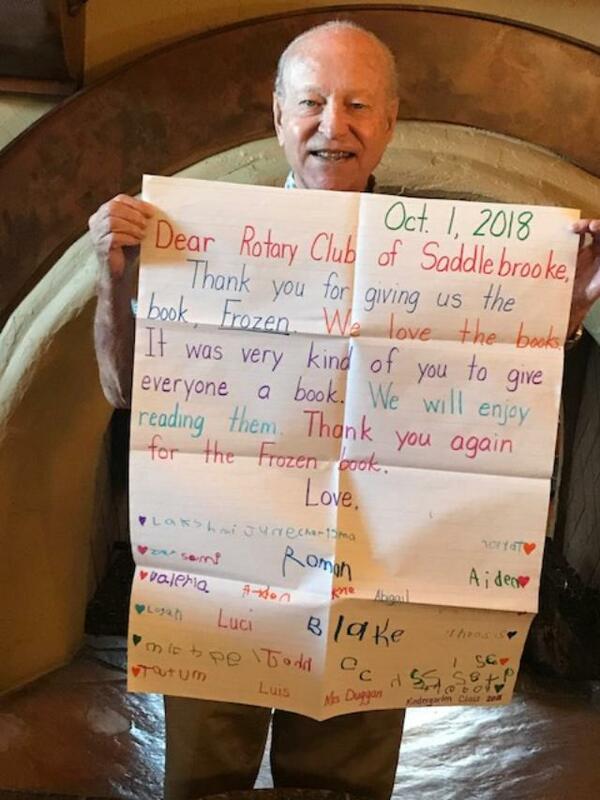 Members of the Rotary Club of SaddleBrooke delivered books to the elementary students at Mountain Vista School in Oracle. 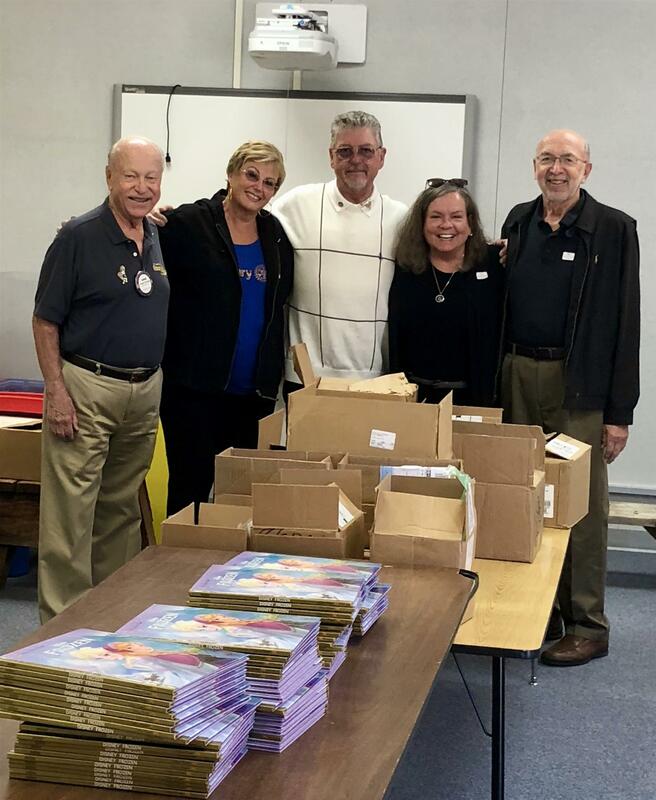 Assisted by Superintendent Dennis Blouser, club members George Corrigan, Chris Millar and his brother Mark, Doc Pohnert, and Barbara Barr delivered books. The middle school kids said they wanted to get books from Rotary too! Don't you love it! 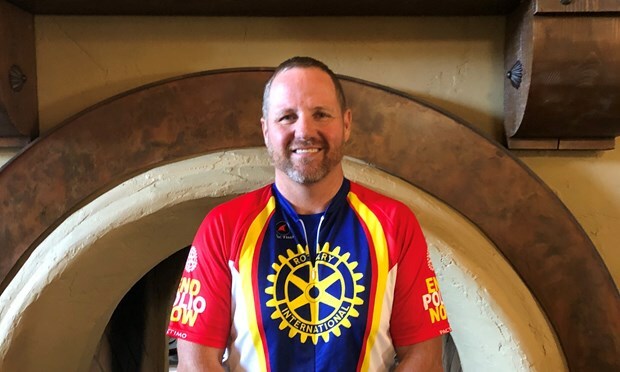 Our very own Mark Miller is again participating in the Ride for Polio! Mark and our club have raised a lot of money to fight Polio during this event. This event is held annually during the Tour de Tucson. For more information, or to help Mark raise funds, click on Ride for Polio! George Corrigan introduced our guest speaker from Handi-Dogs, JoAnn Turnbull. Ms. Turnbull joined Handi-Dogs in July, 2012. Her passion for dogs and how they help improve people's health and happiness is the reason she has devoted the last 5 years working with organizations focused on the human/animal bond. Handi-Dogs is a non-profit that helps our Veterans, seniors and people with disabilities train their own dogs to be their service, therapy or well-mannered companion dogs. 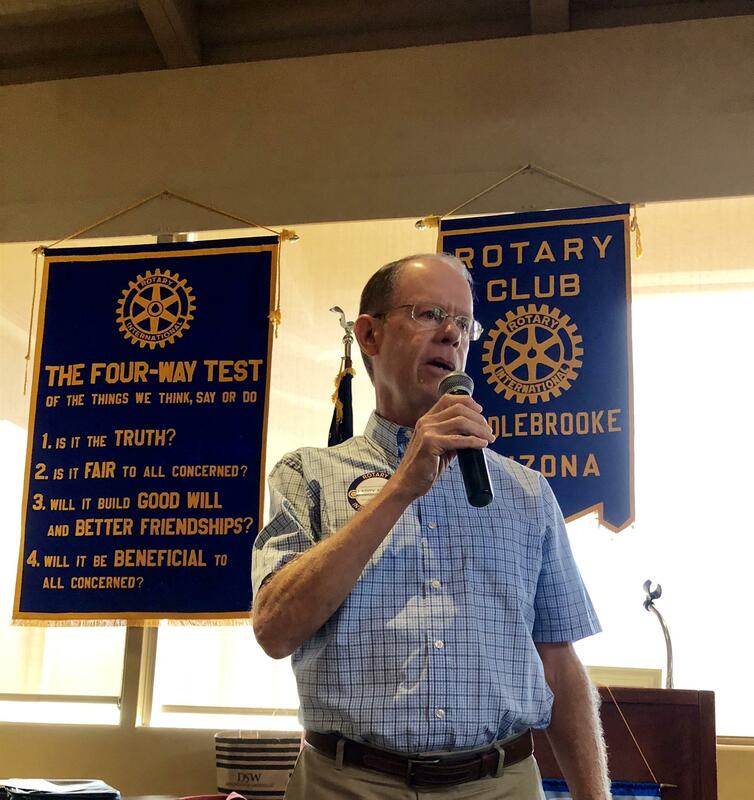 SaddleBrooke resident, Jim Cloer, entertained our Rotary Club with stories, information, and humor about local critters. 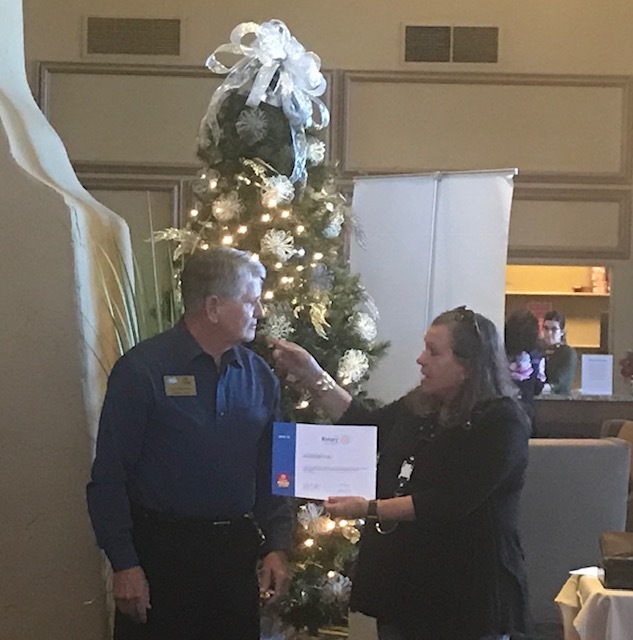 In the photo above, Jim receives the club's certificate of appreciation from Peggy Knowles, the Program Chair. 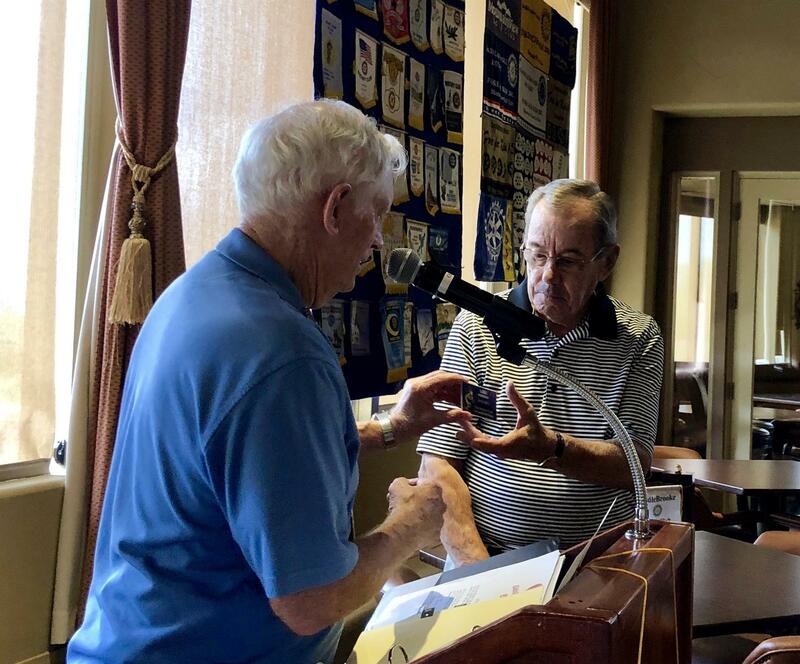 A warm welcome to our newest Amigo Member, Lou Robisch. Lou and his wife, Sue, are SaddleBrooke residents. Lou and Sue are very active in their volunteer work with the Little Hooves and Big Hearts! Welcome, Lou! 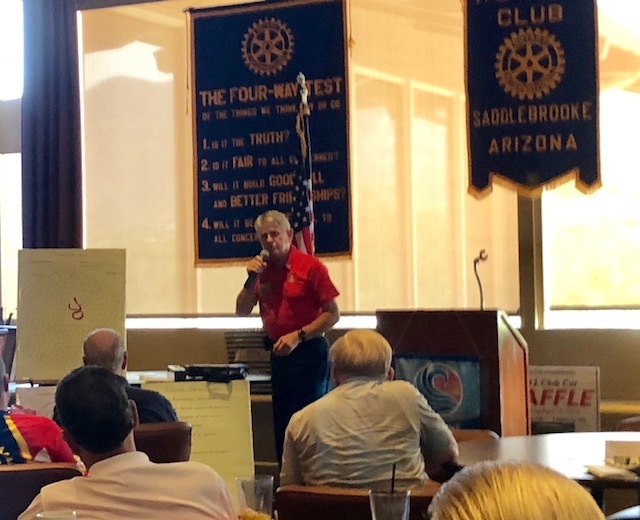 SaddleBrooke resident, Larry Allen, shared the history and in-side story of the University of Arizona Mirror Lab. Rotary members and guests were fascinated by the stories and information they heard about the Mirror Lab. Larry serves as a docent at the lab, which is located under the University of Arizona football stadium. 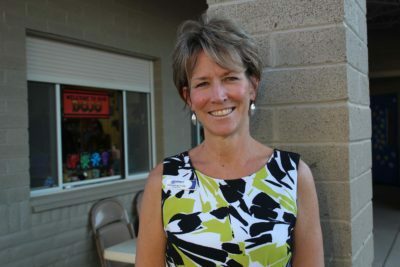 Lisa Hansen, the Education Director of Sold No More, spoke on Human Trafficking in the Tucson Area. Lisa speaks to schools in the area in an effort to prevent Human Trafficking. Tucson has the 2nd highest rate of Human Trafficking in the nation and the average age of the victims is age 11.
the way to making this world Polio free. Thank you Jim for your service. 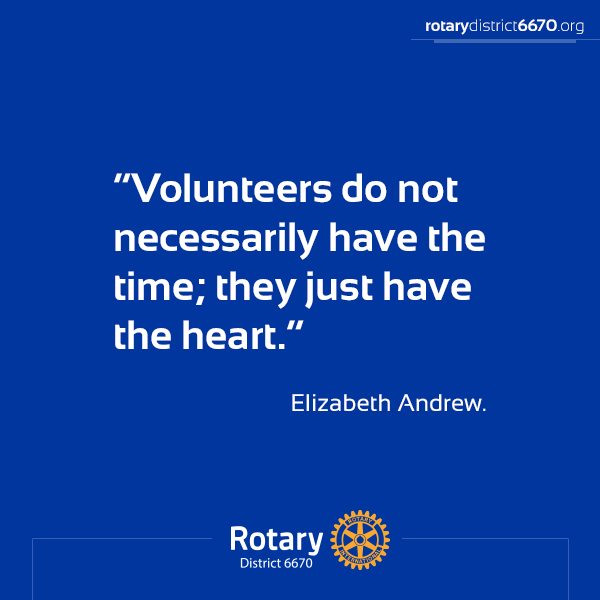 become more passionate and effective Rotarians. plant these trees on February 14th.